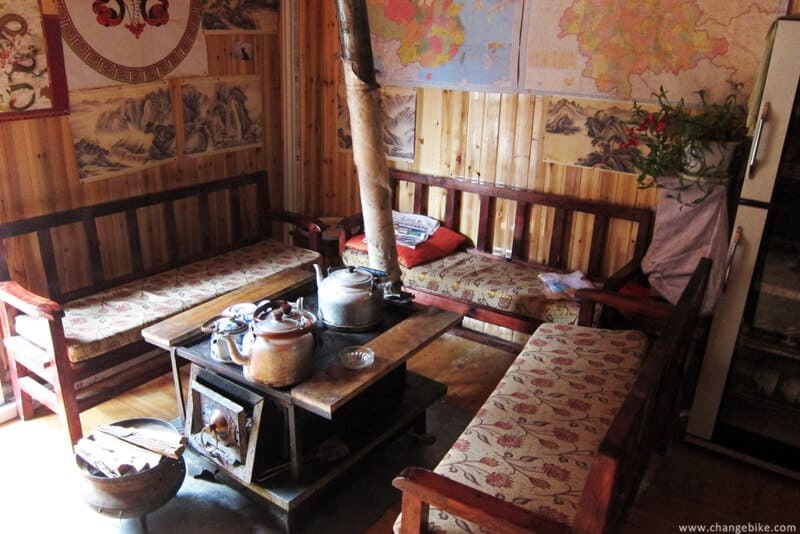 These were interior furnishings of Daylight Inn. 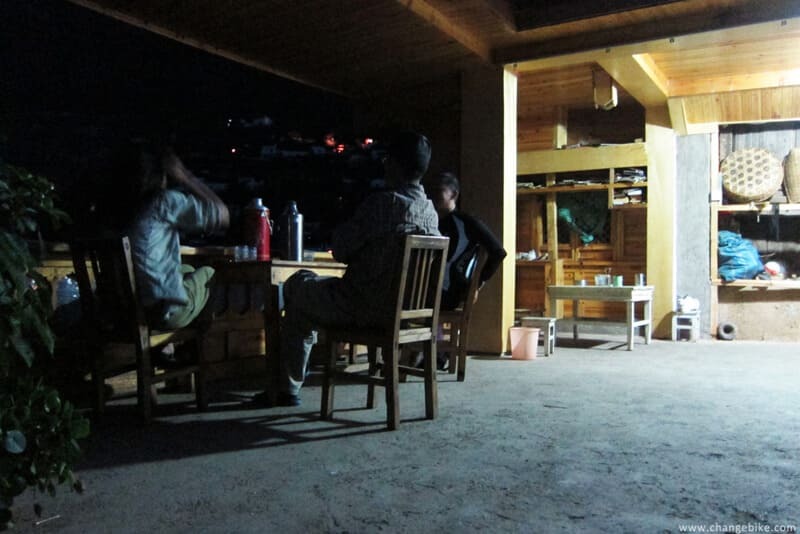 and people chatted about domestic trivia which is the happiest time. 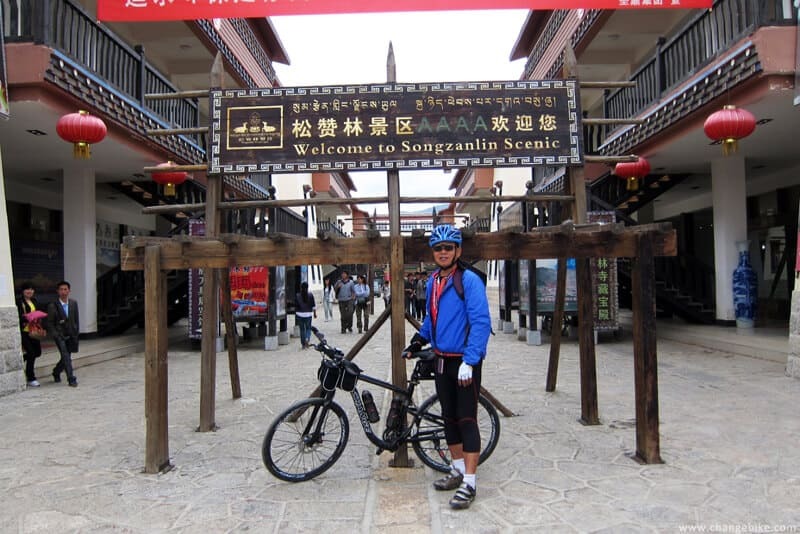 After breakfast, Mr. Hua and I arrived at Songzanlin Monastery after riding about 10 km. 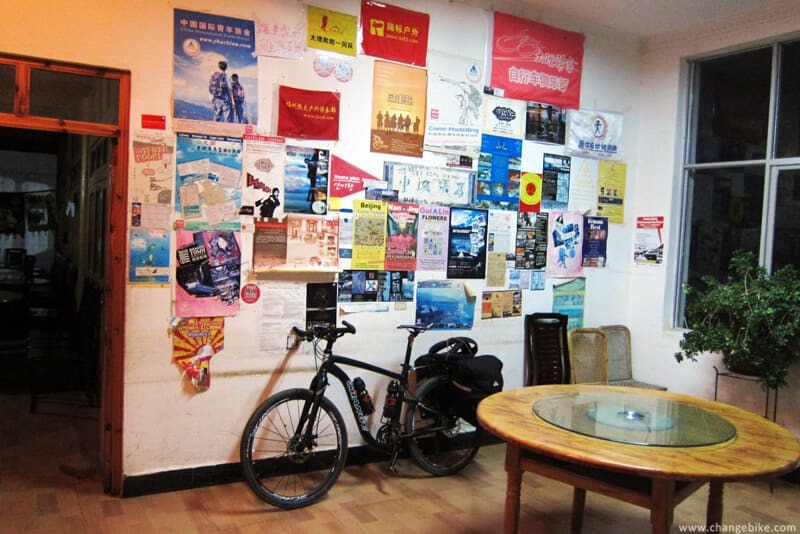 we just got a message that we would not see anything unless we spent 85 RMB on tickets. 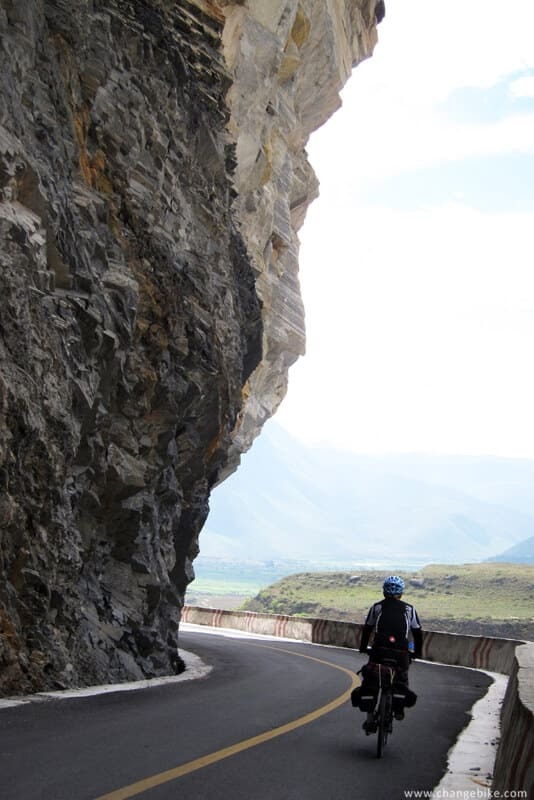 So we decided to leave the sight spot. 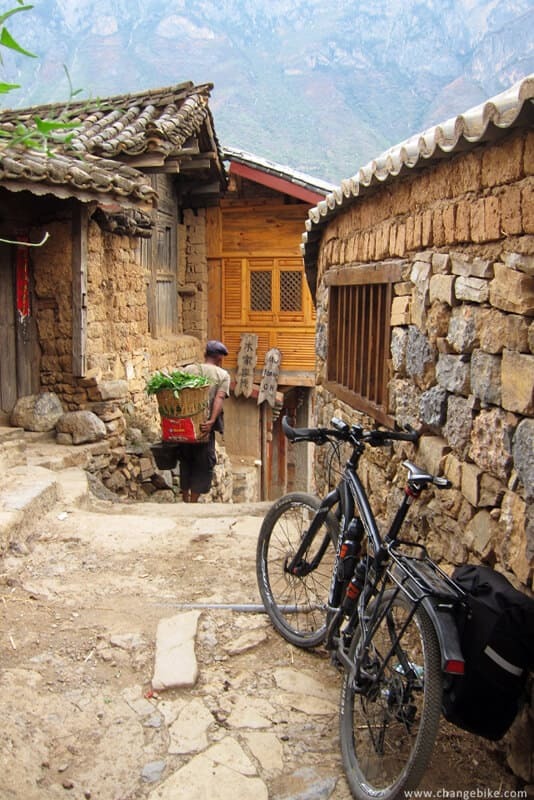 We rode back to the old town on the way, and walked around at our convenience. 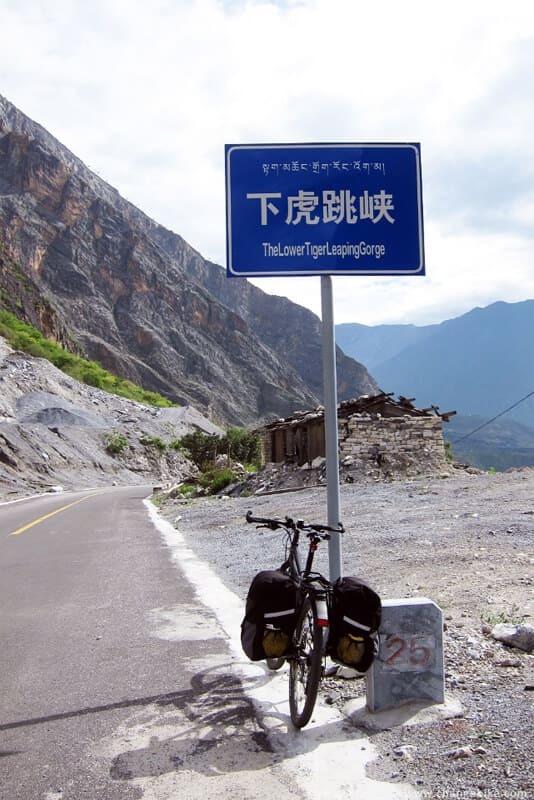 Actually, I did not feel special. 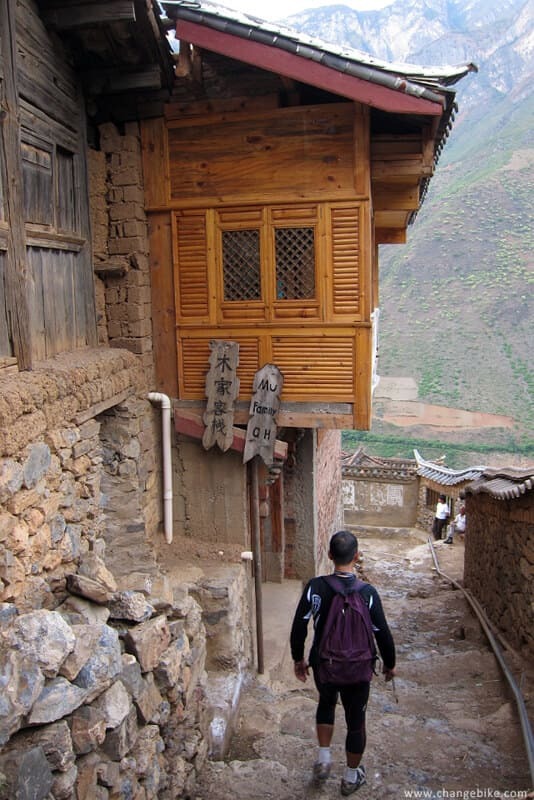 Maybe I was a little sick (dizzy and cold) to cause the spirit of the poor. 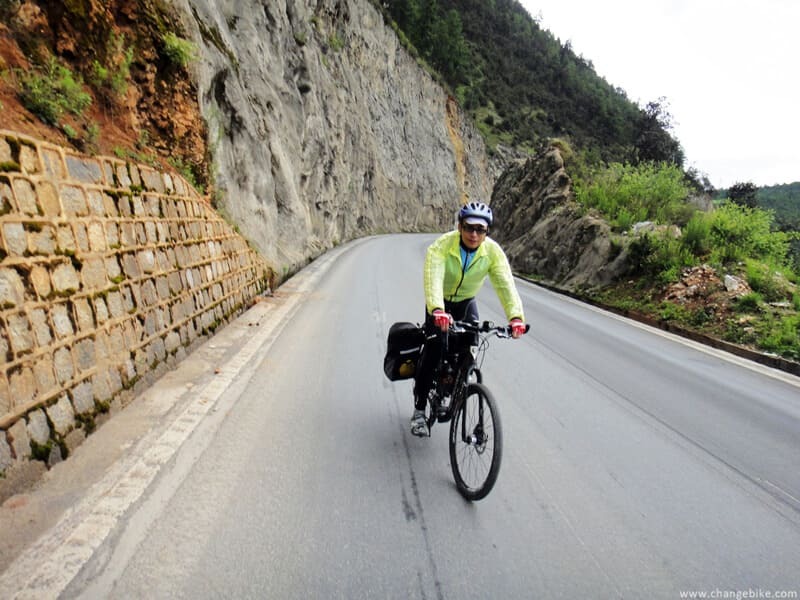 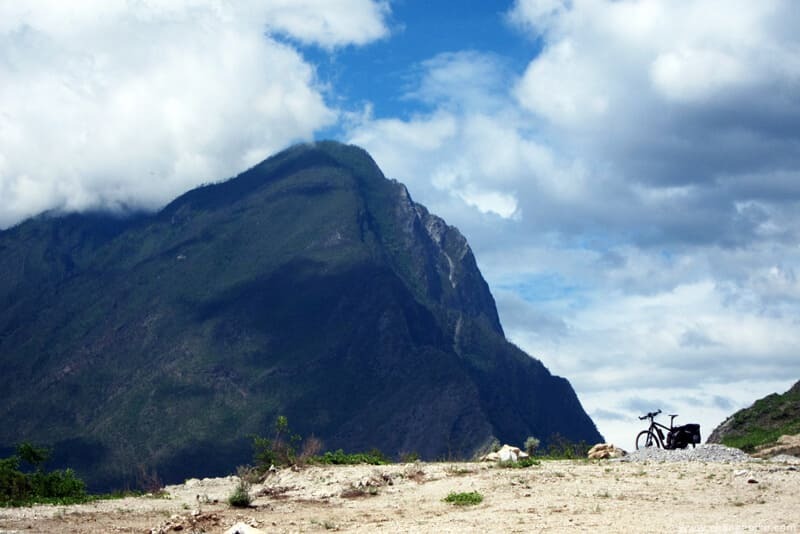 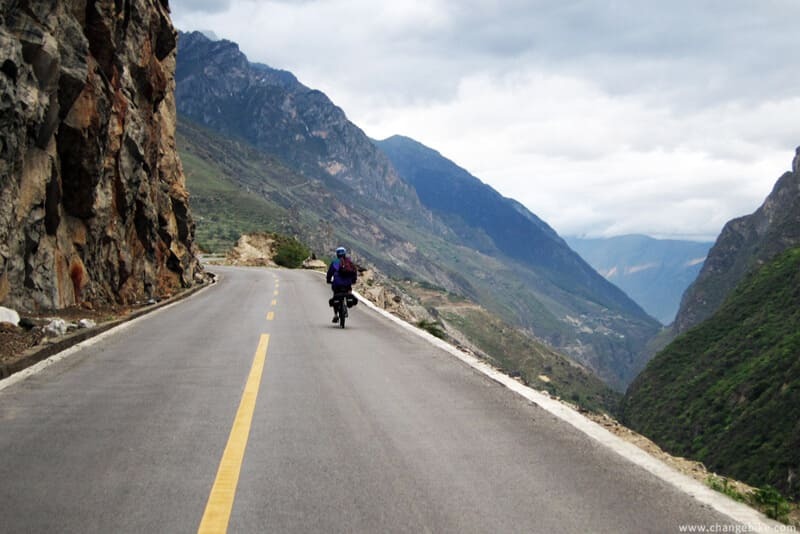 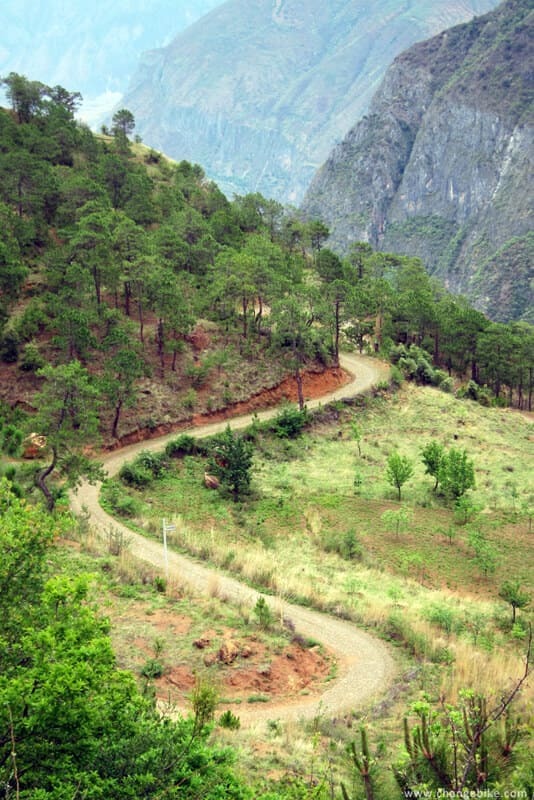 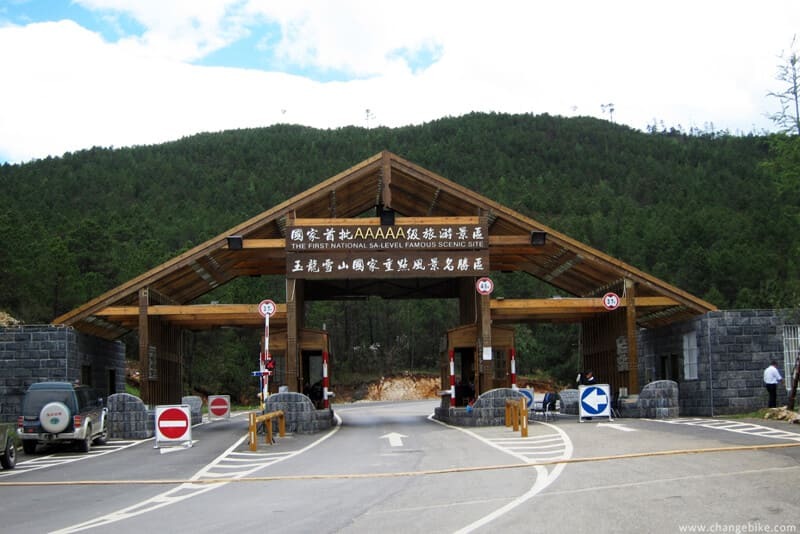 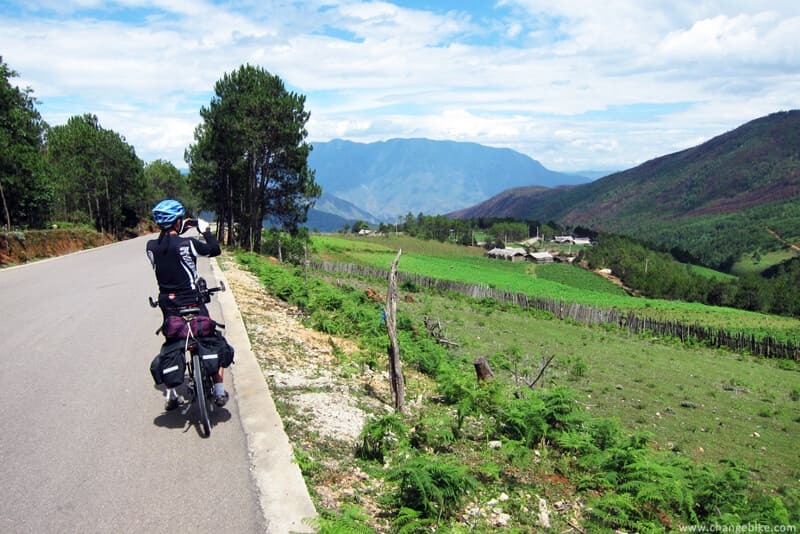 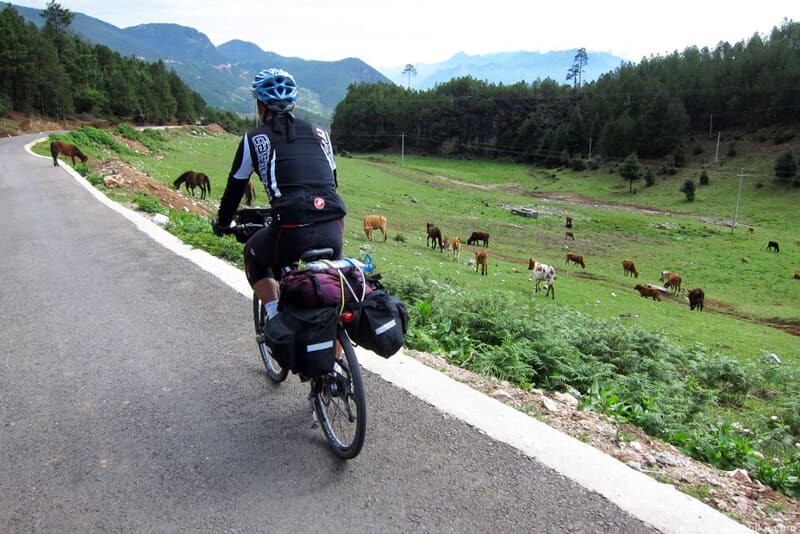 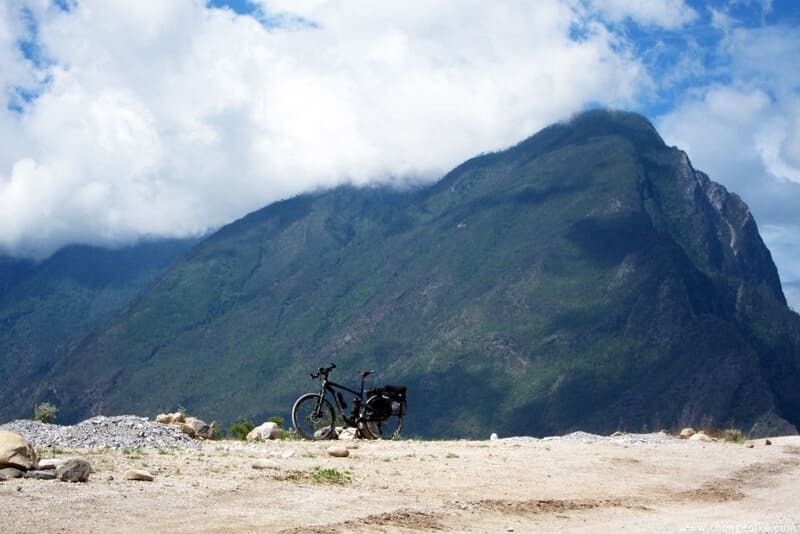 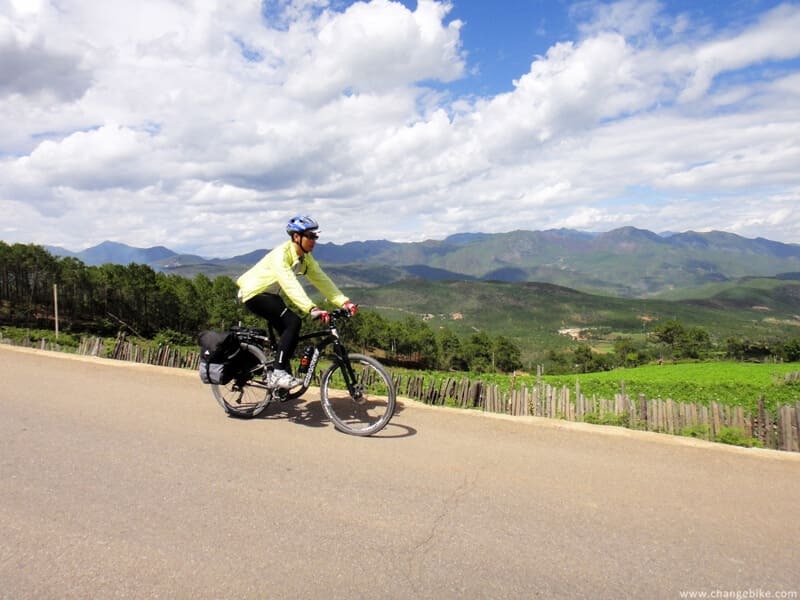 we kept riding south (the direction of Lijiang) along National Road No.214. 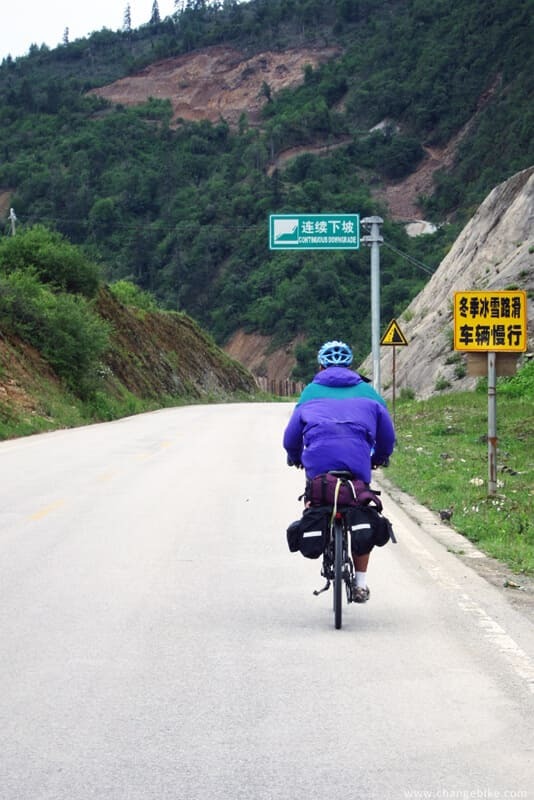 Basically, we rode up and down for 3,200 meters ahead of 60 km, and the sceneries were a little drab. 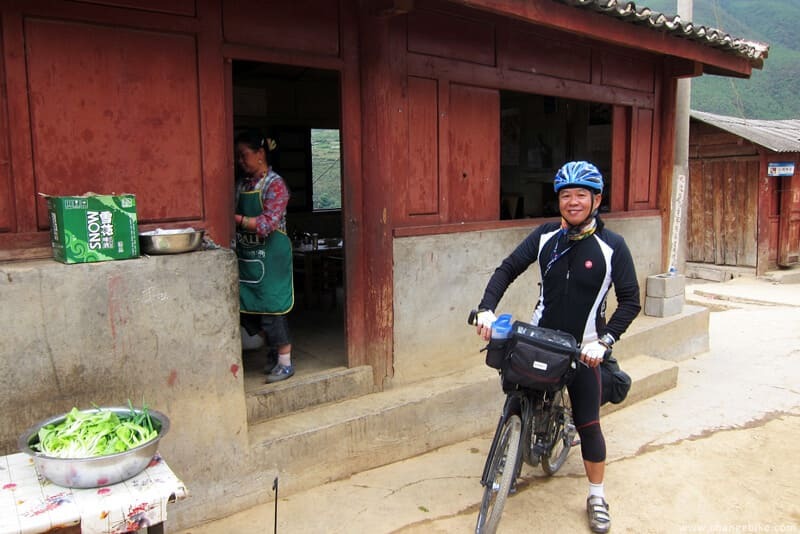 I felt tired due to the up and down road, and additionally, I was dying to stop riding for taking a nap. 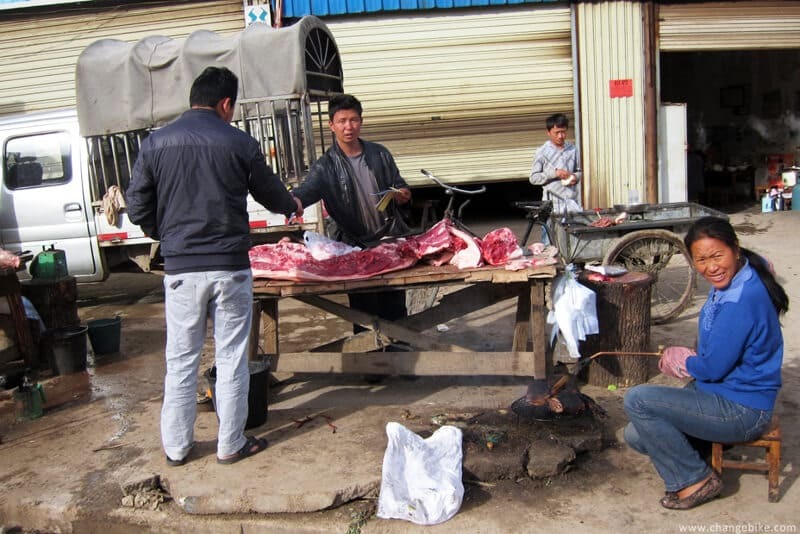 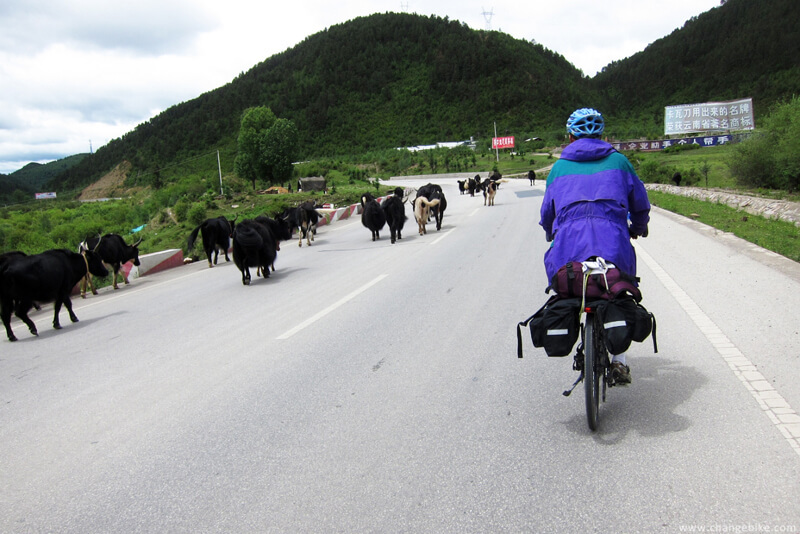 We ran into several riders, who would ride to Lhasa, along the way. 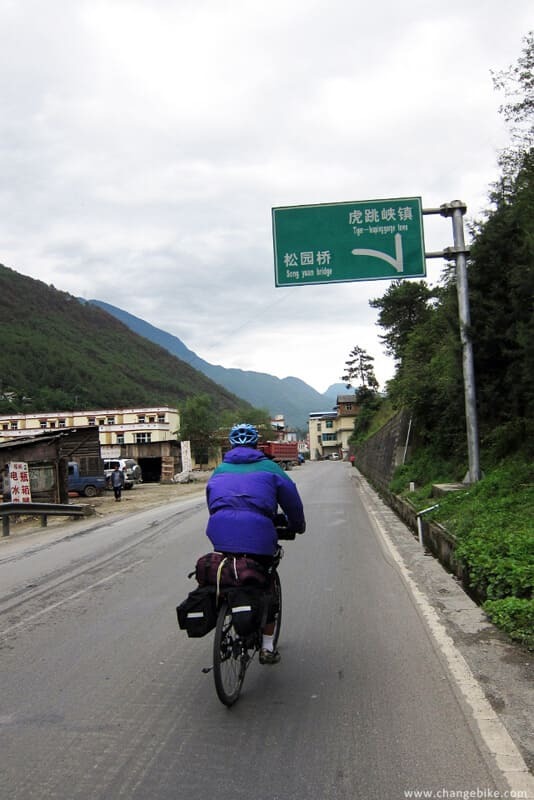 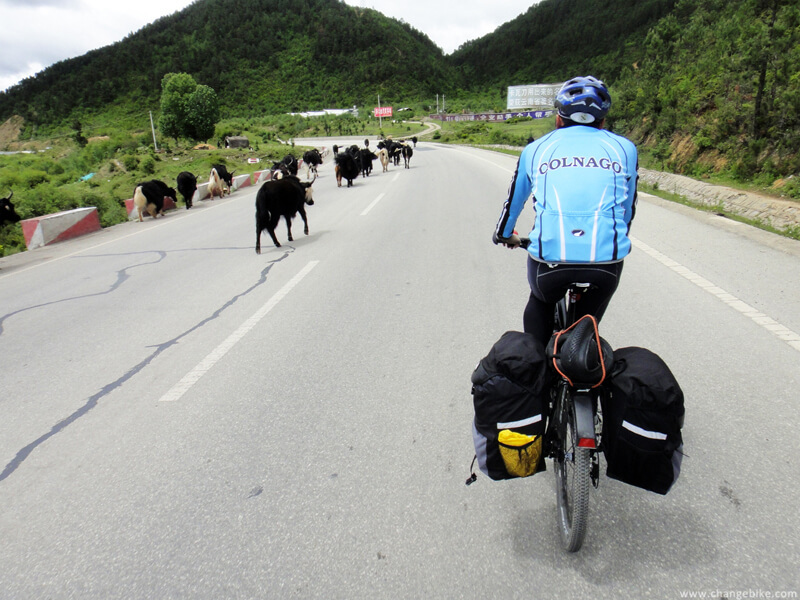 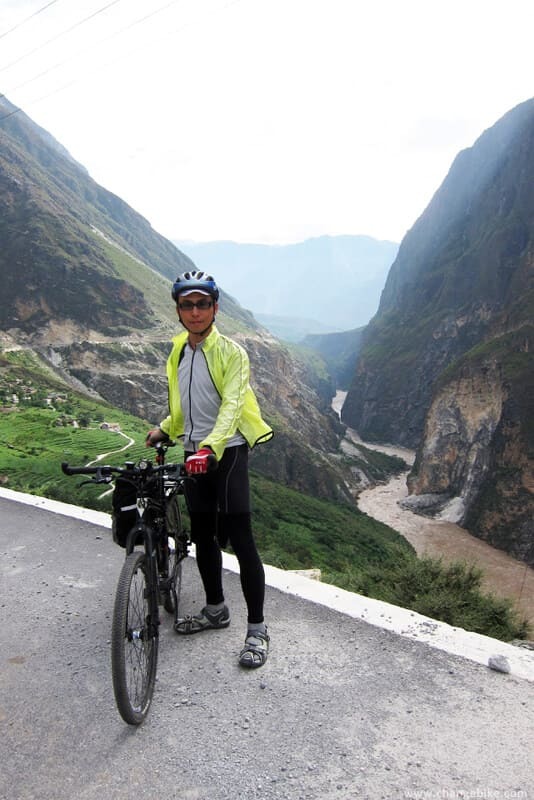 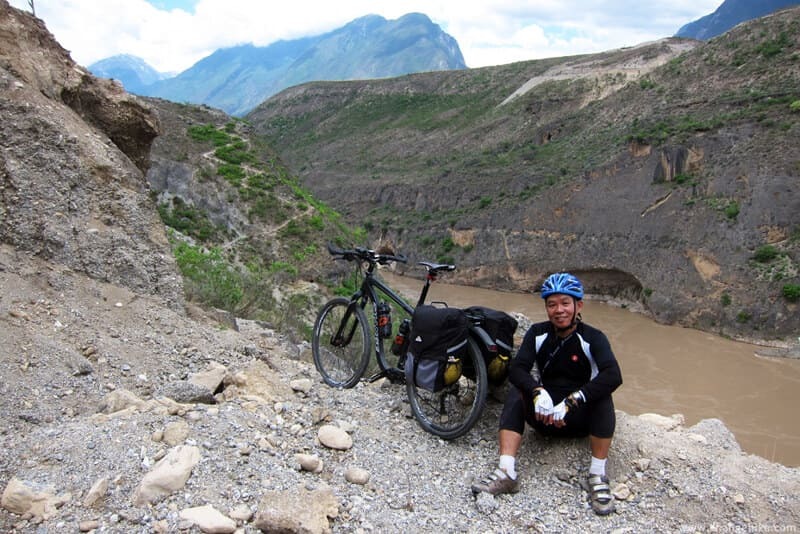 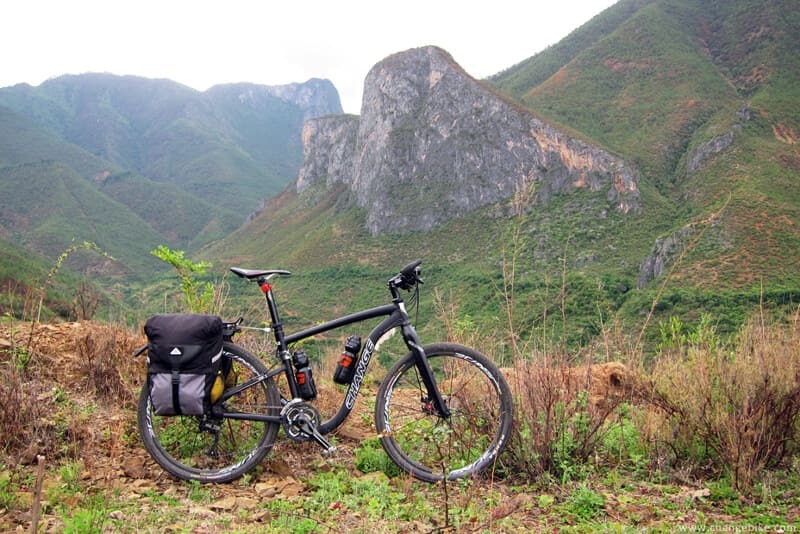 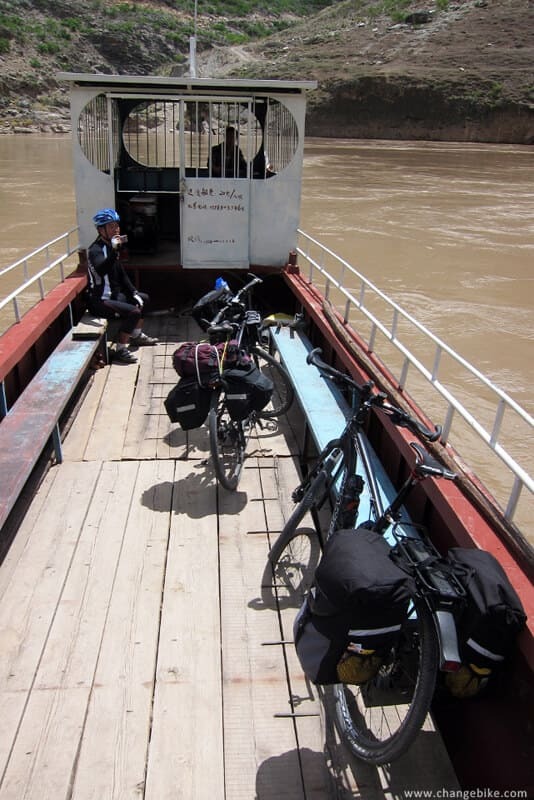 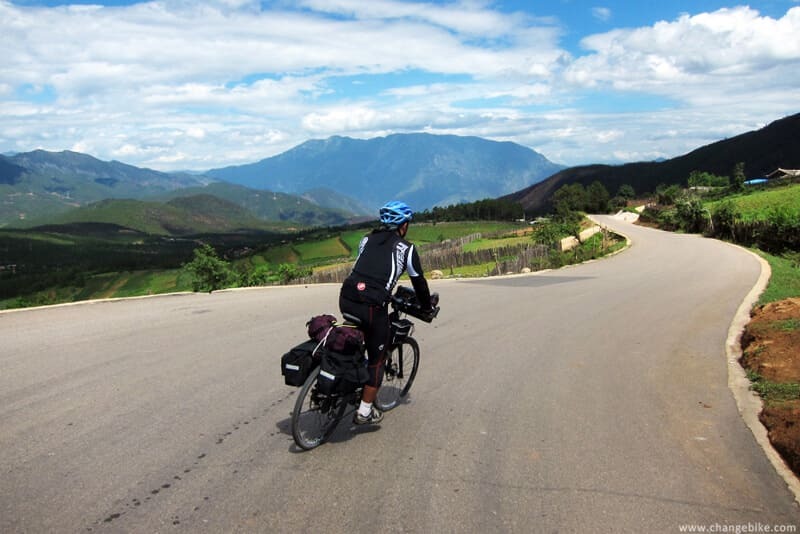 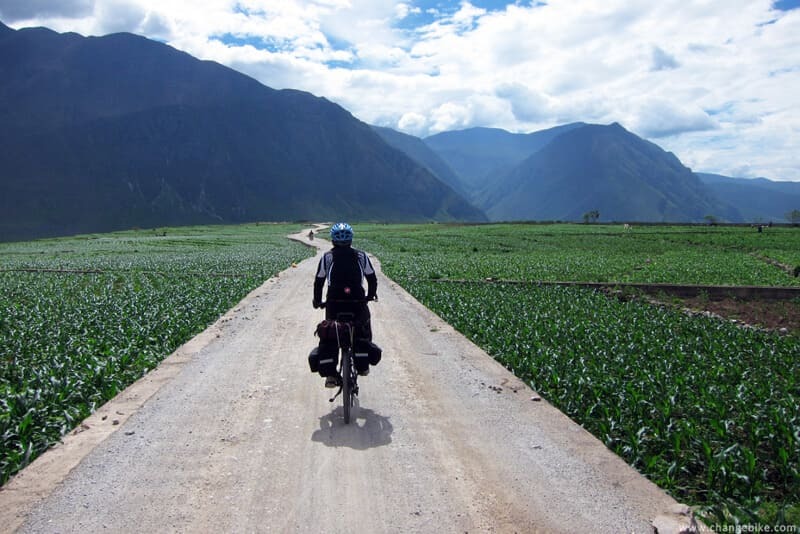 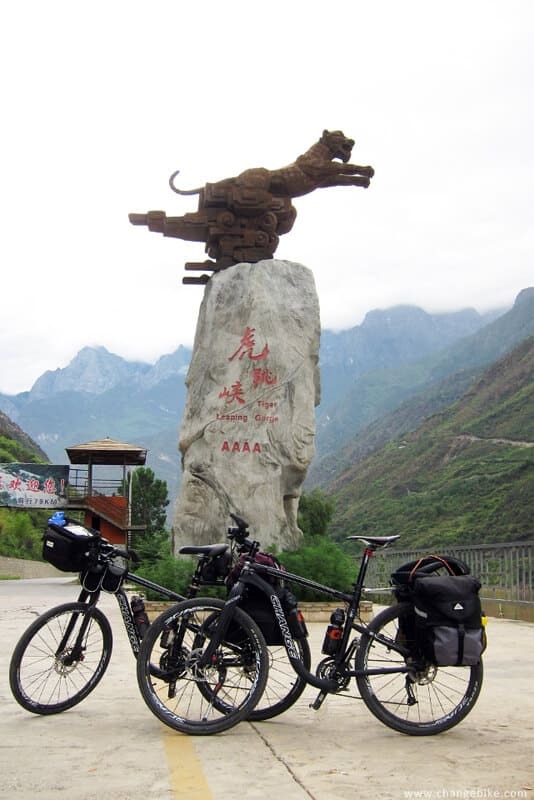 I almost could not believe that he would ride to Lhasa. 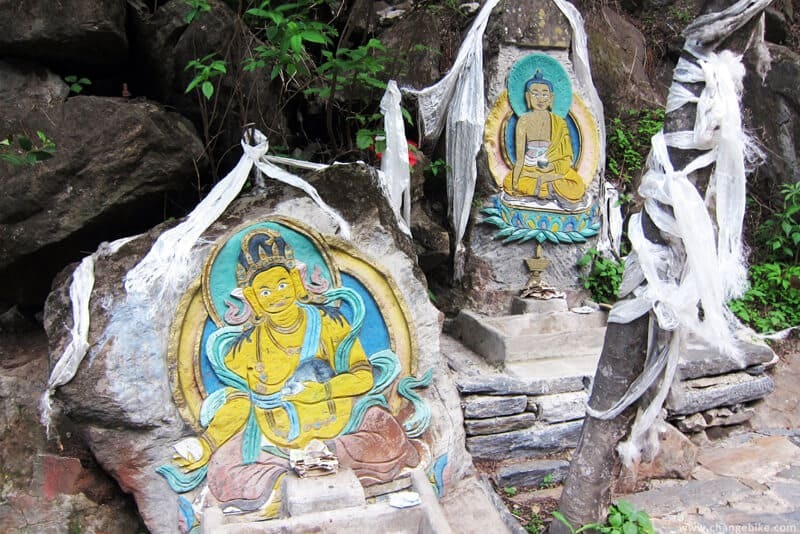 It was rare to see Mani stones, so we took pictures of them specially. 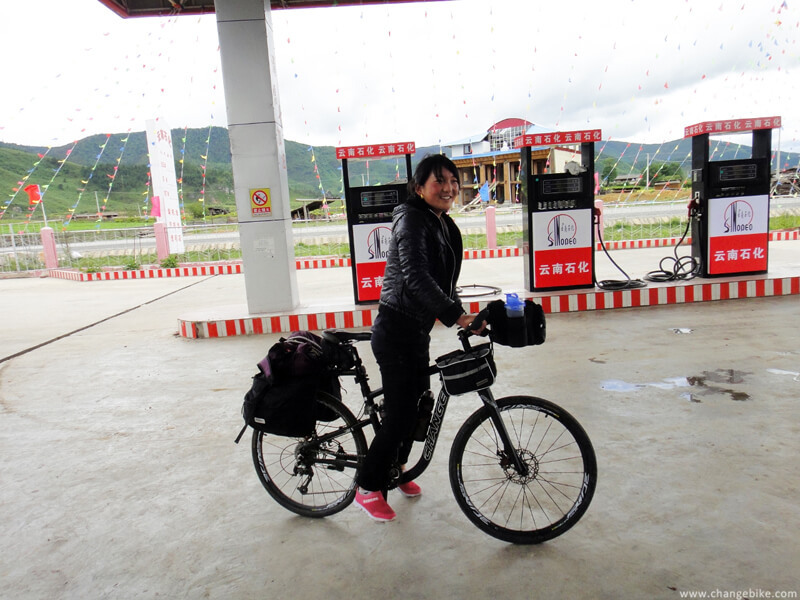 A gas station was in our sight, so we dropped by for supplies and chatting with staffs incidentally. 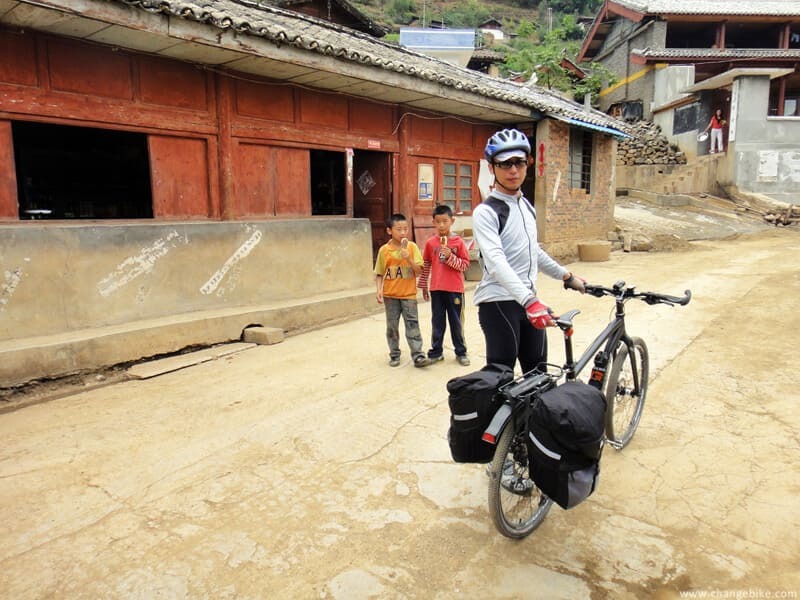 she said that the bikes were easier to ride than her imagination. 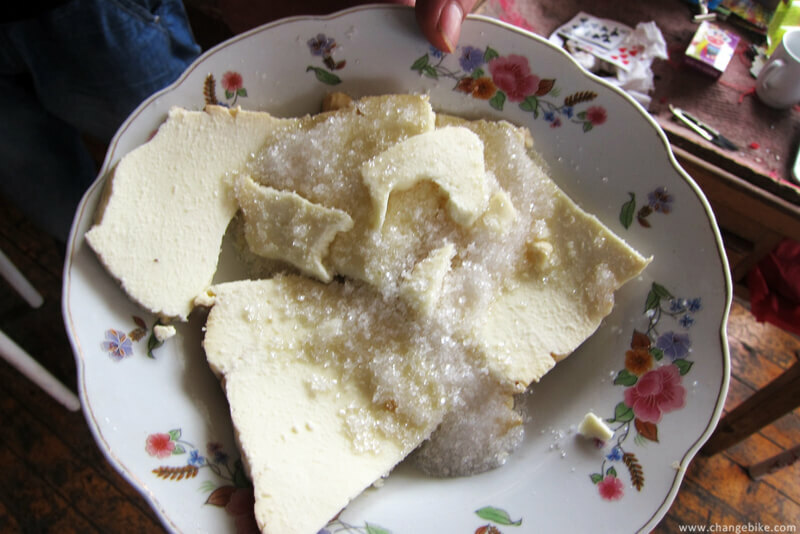 After that, she treated us some homemade cheese, and we ate by adding sugar (or salt?) 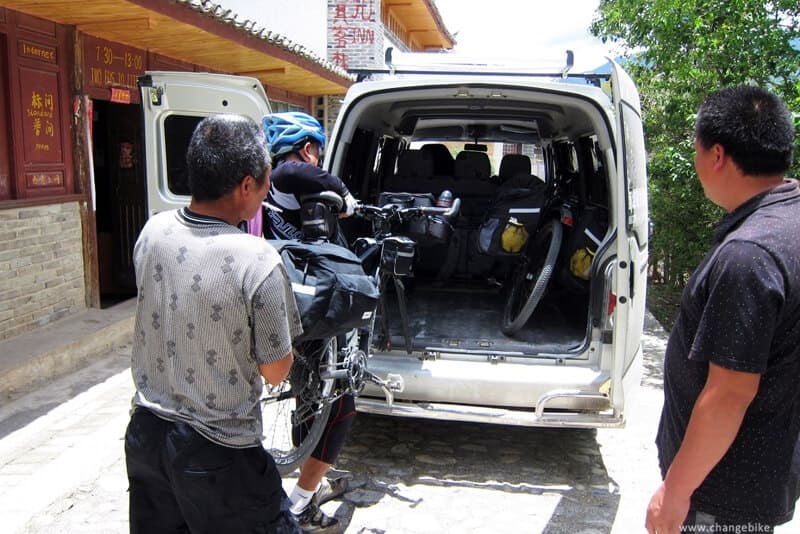 one by one piece. 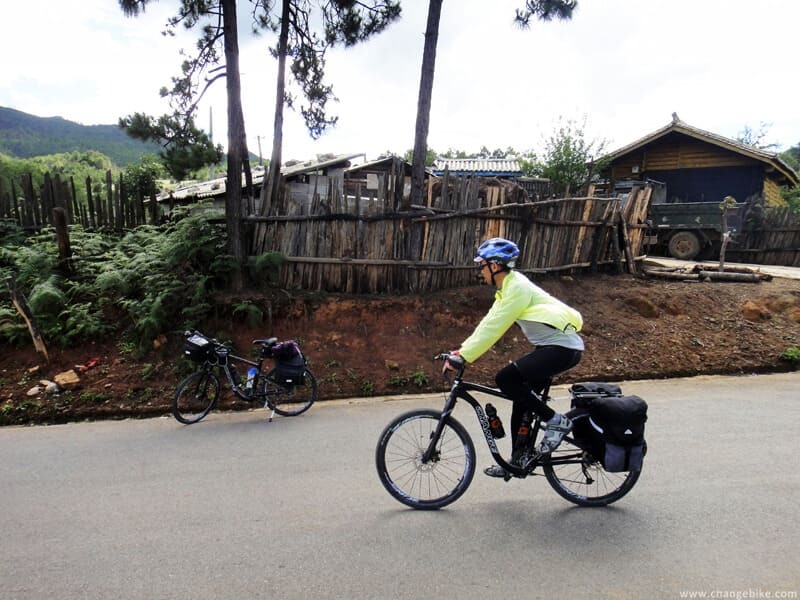 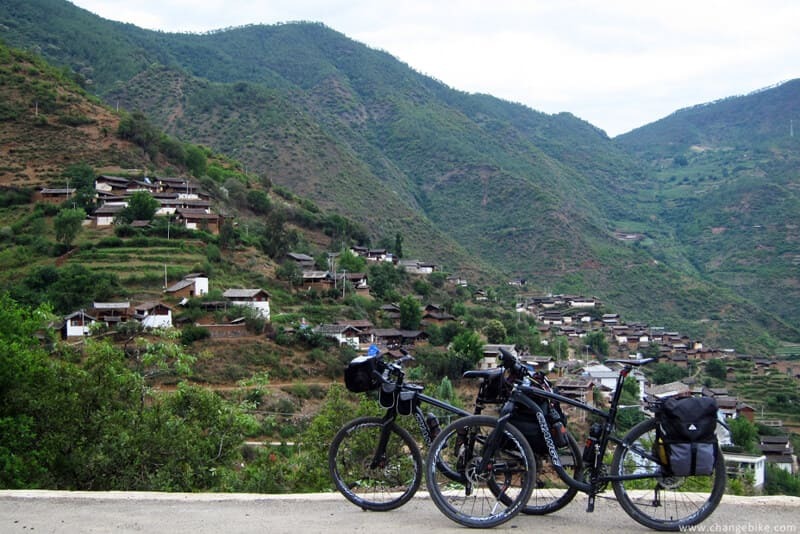 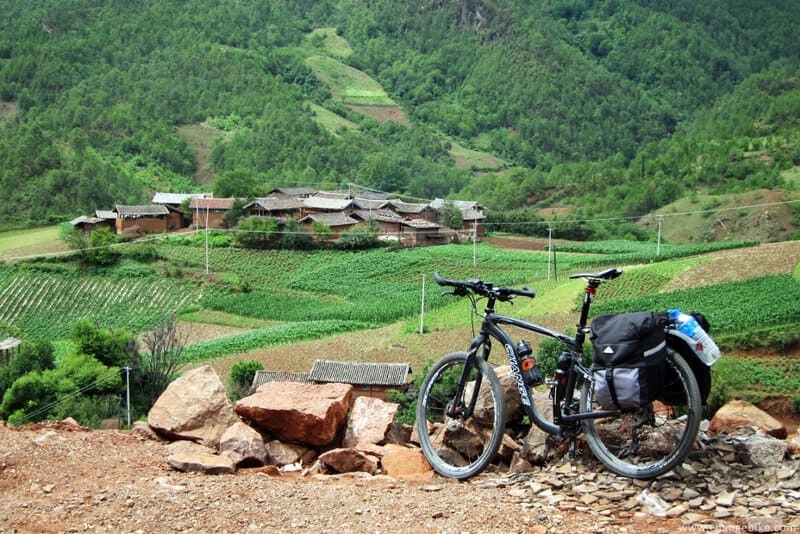 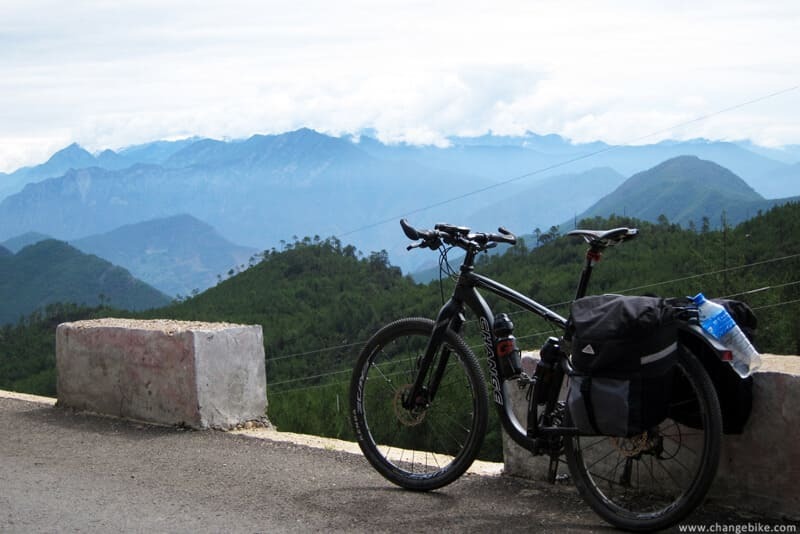 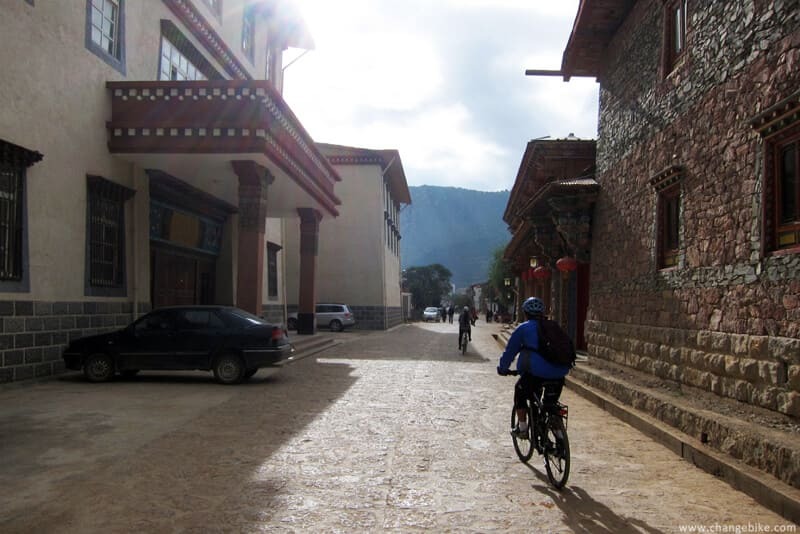 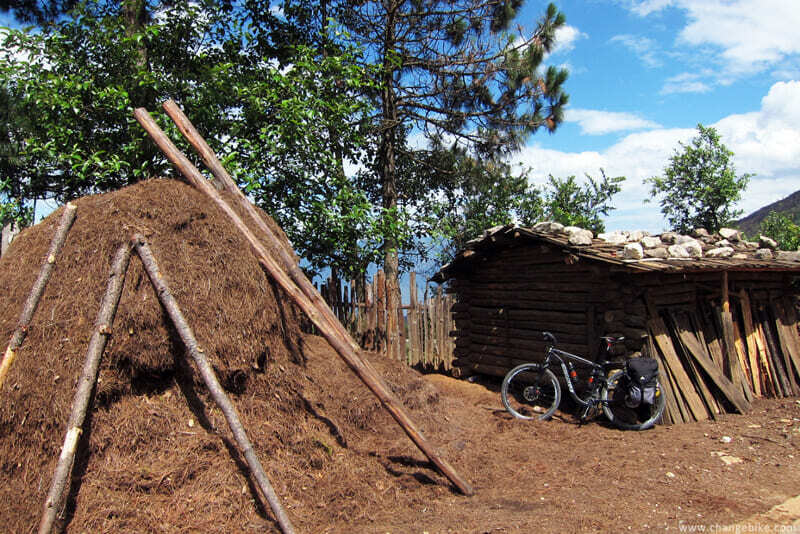 After riding for 60 km, we rode downhill for 40 km to Hutiaoxia Town (the elevation gain is 1400 meters). 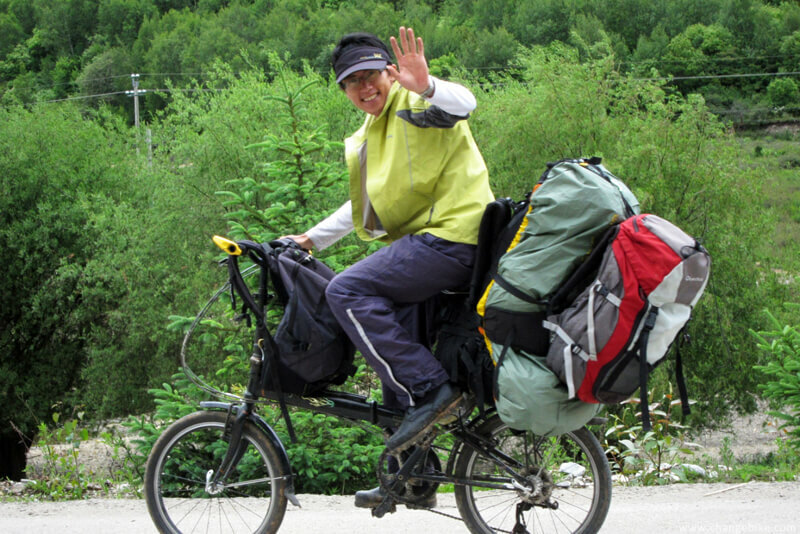 and he said that he was motivated by a movie called “KORA”. 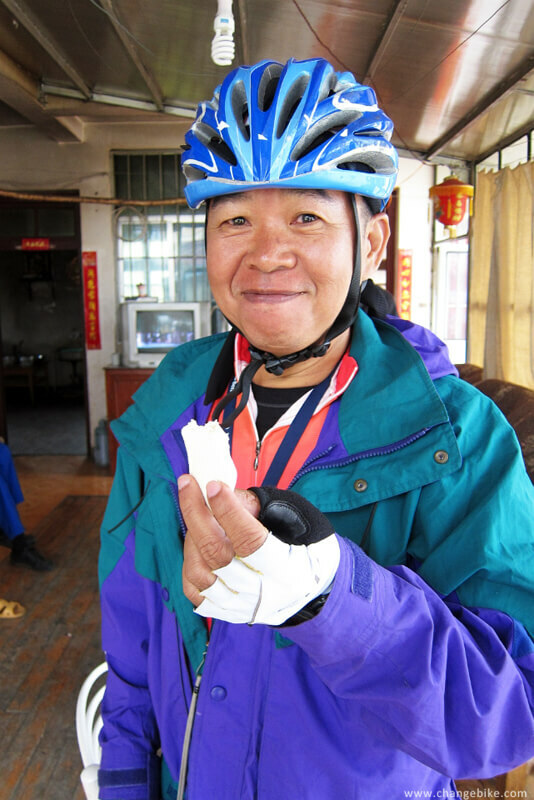 The other one said he would like to complete his dream. 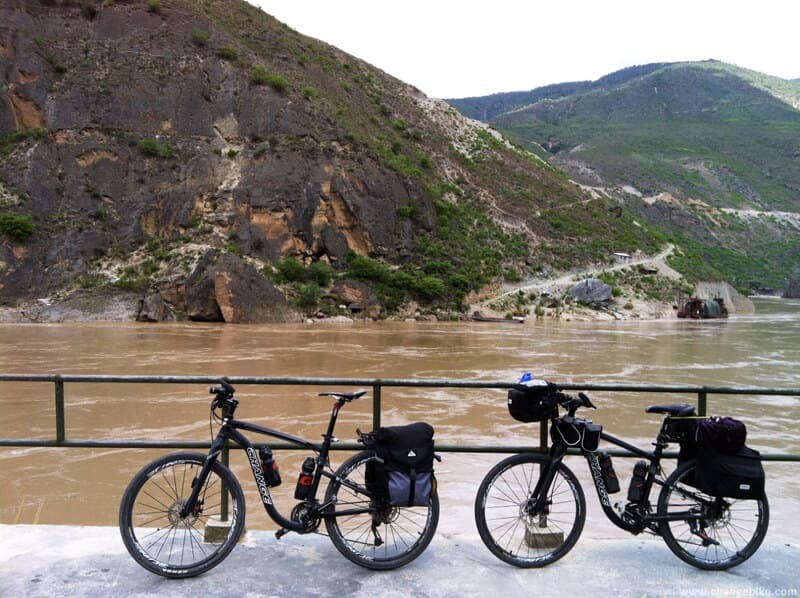 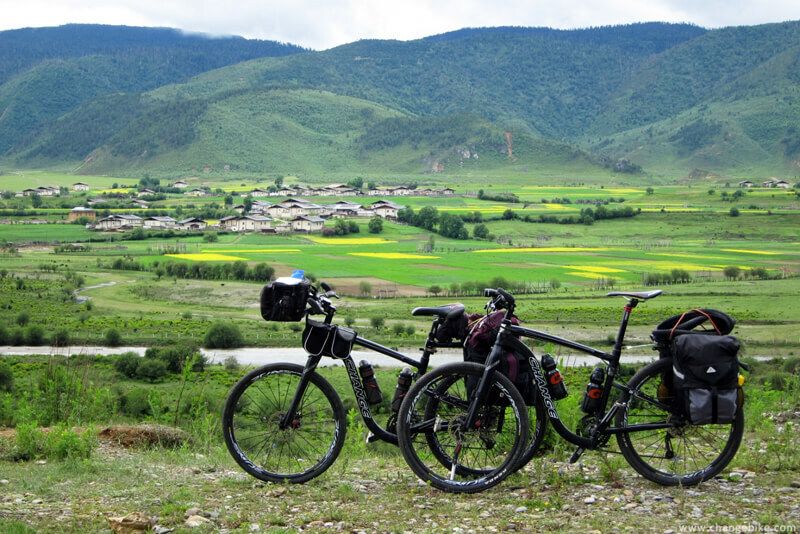 Another two riders who would ride to Lhasa. 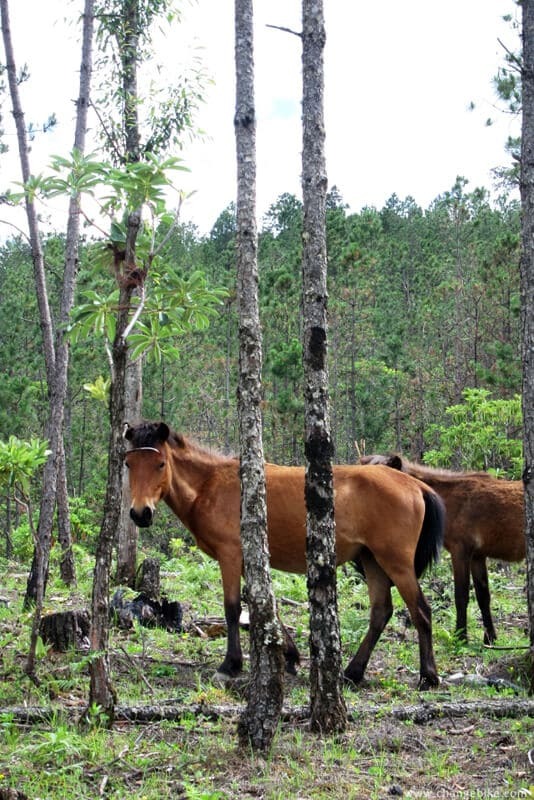 I had already known without asking them. 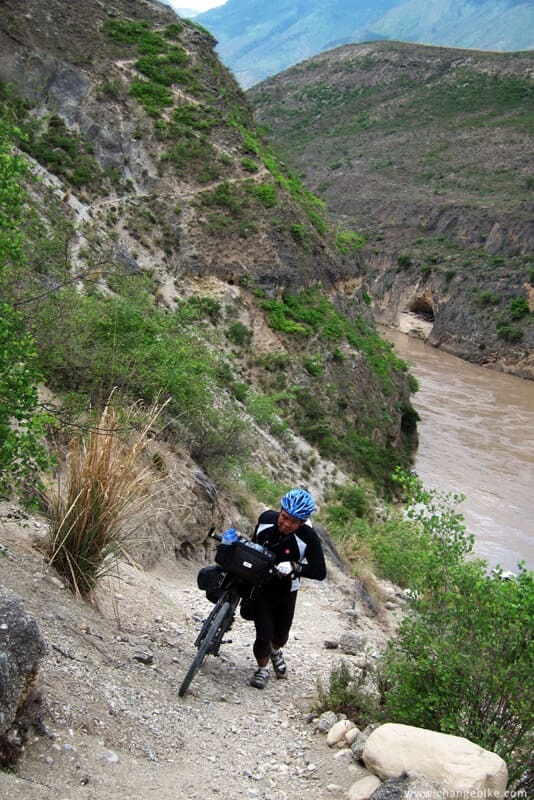 We rode downhill all the way, and that was satisfying. 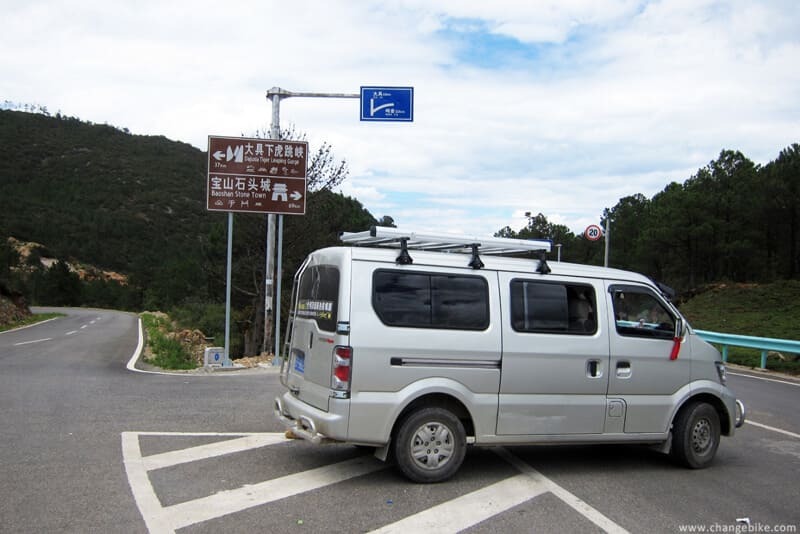 It was 5:30, and we arrived at the head of Qiaotou. 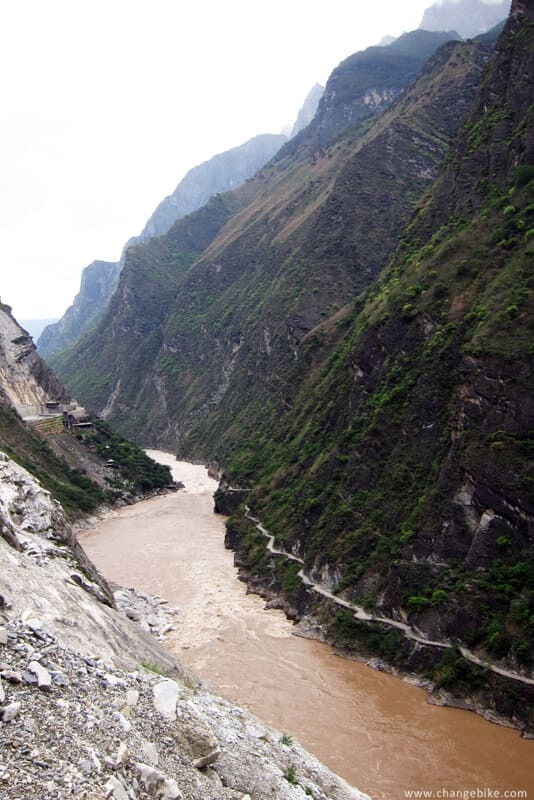 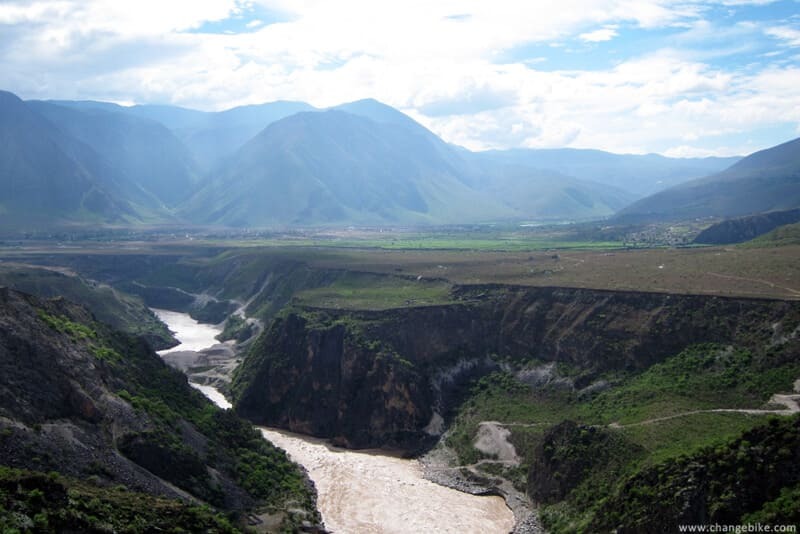 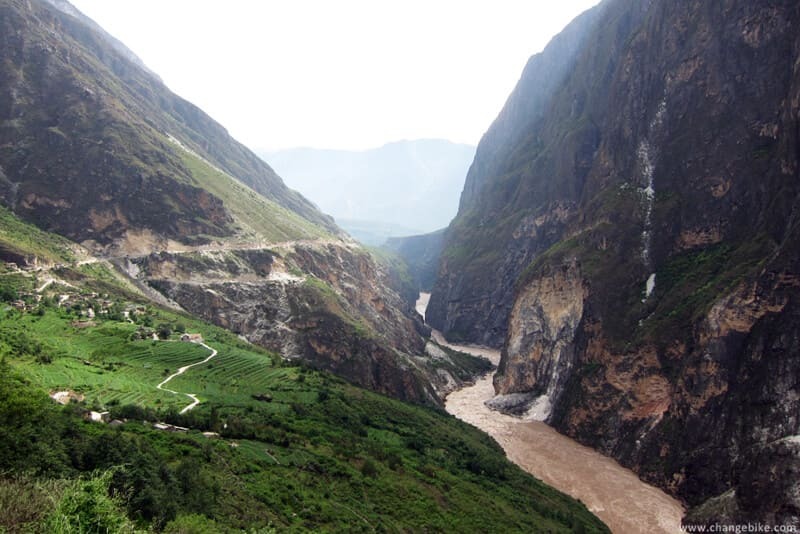 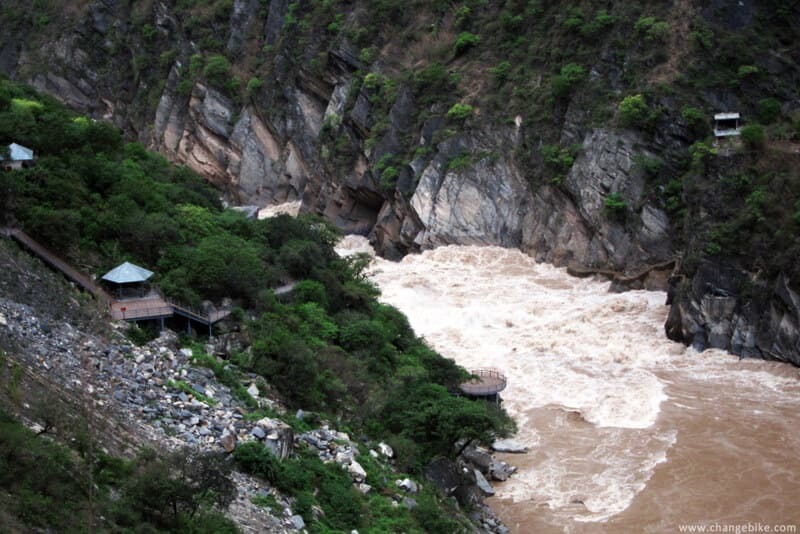 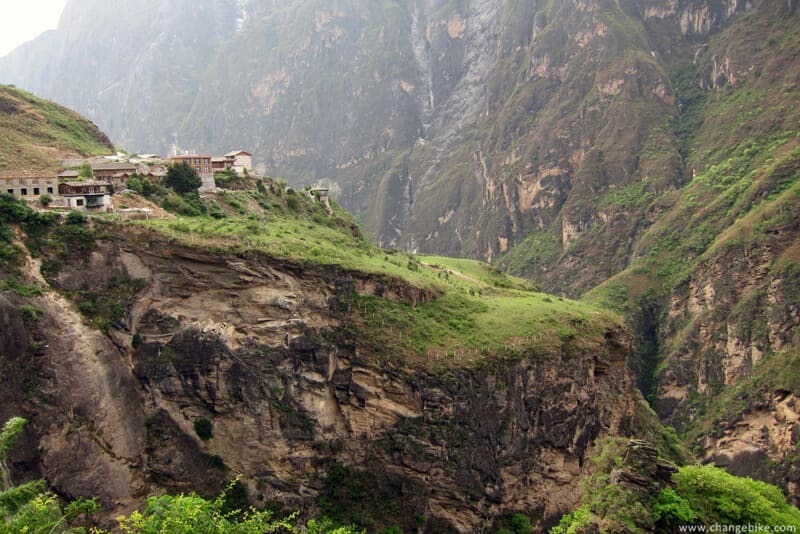 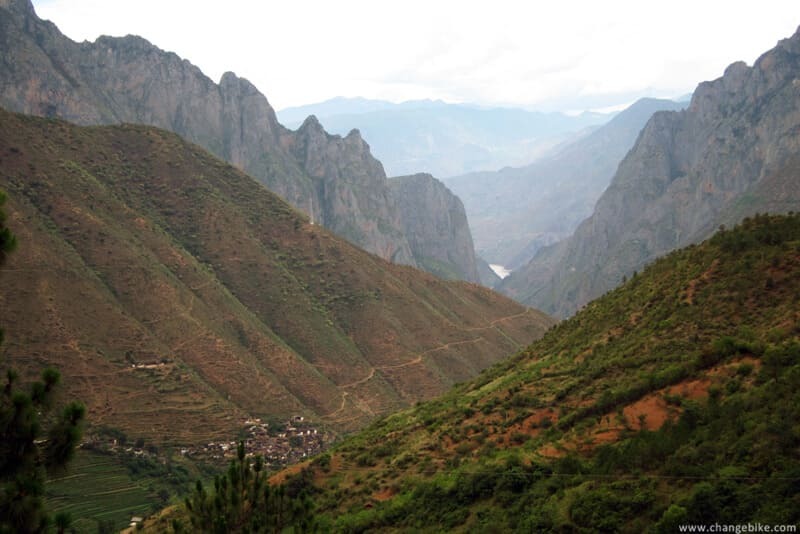 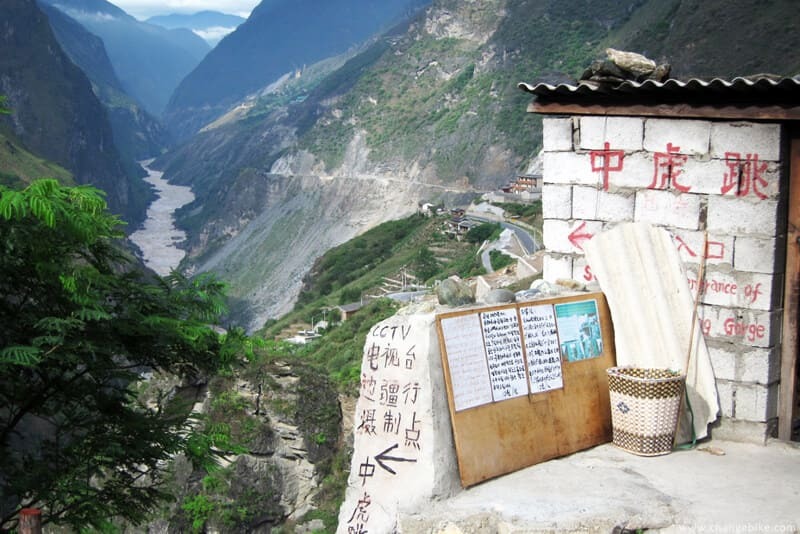 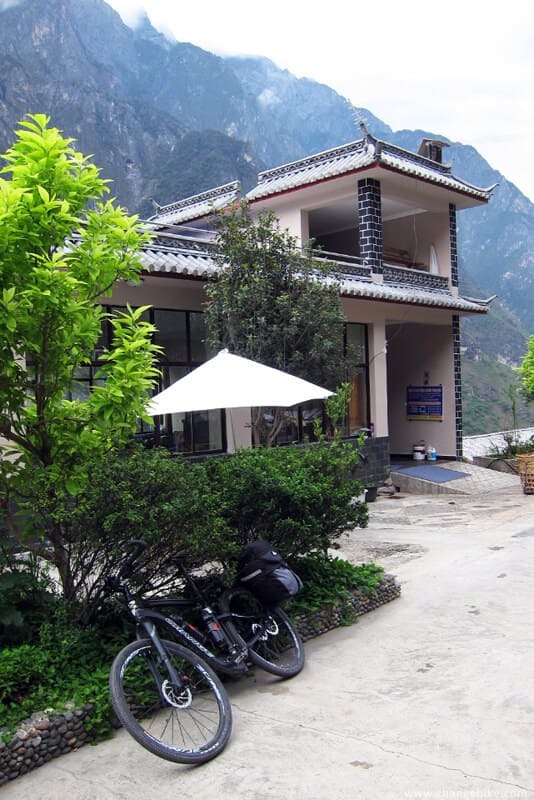 and we had to ride to Tina's Guest House located in Middle Tiger Leaping Gorge before the dark. 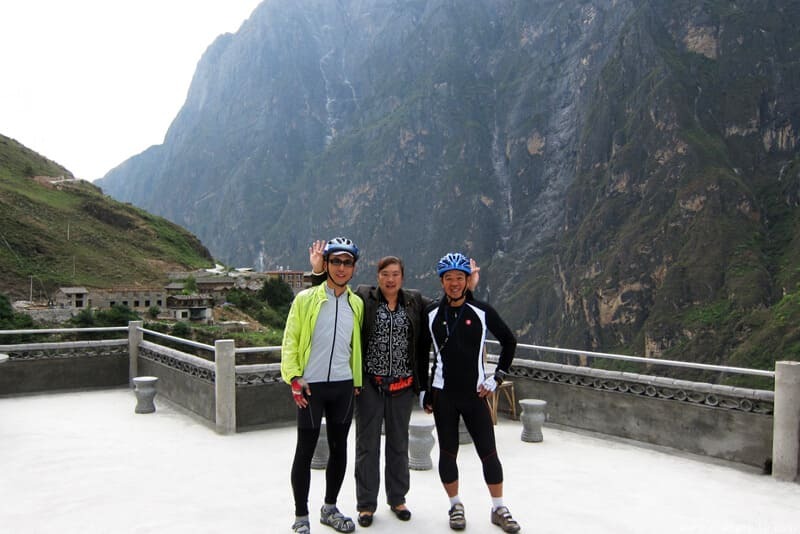 was really magnificent; however, the view of Taroko in Taiwan was inferior. 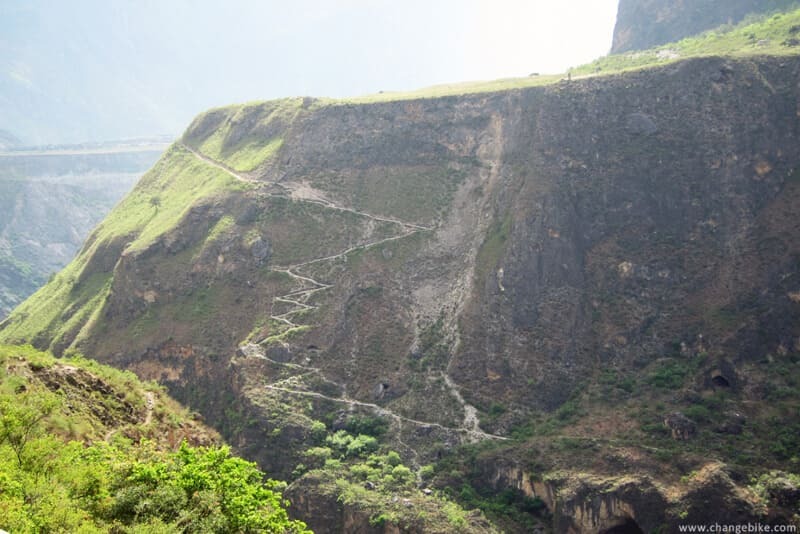 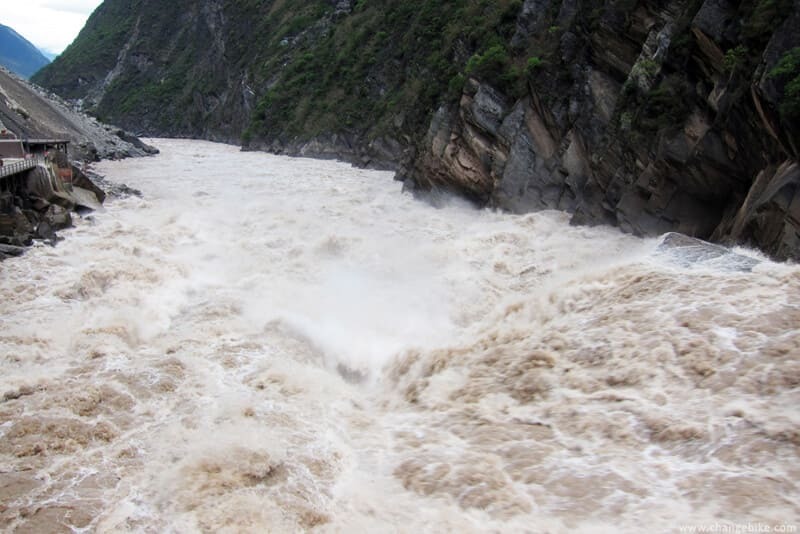 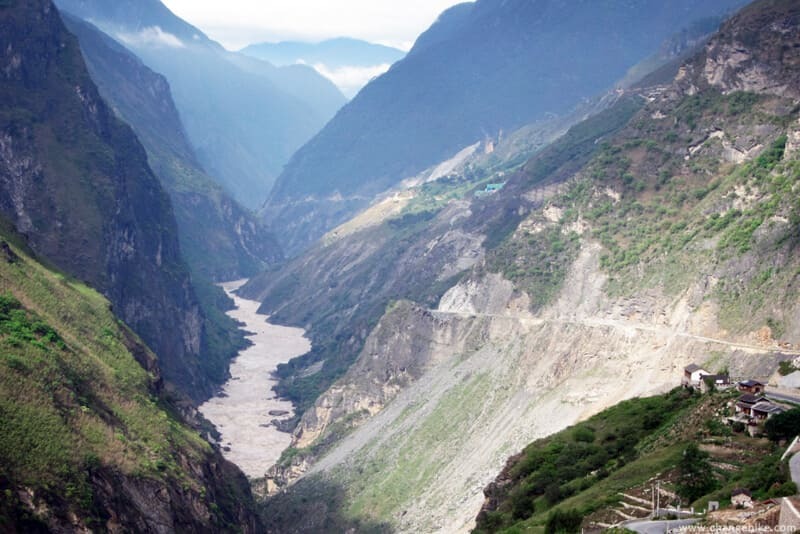 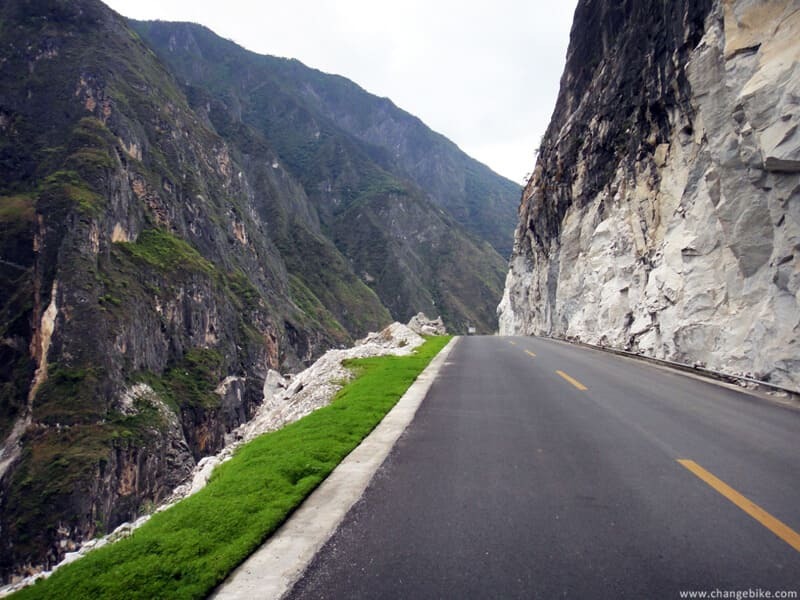 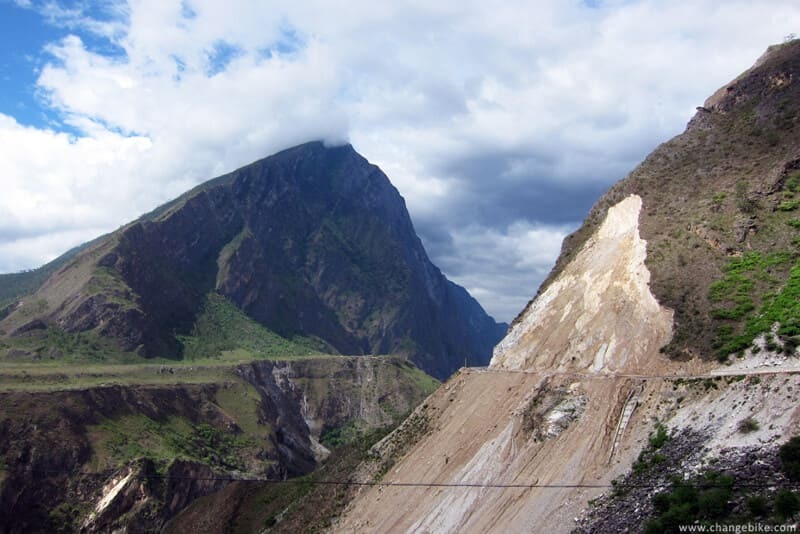 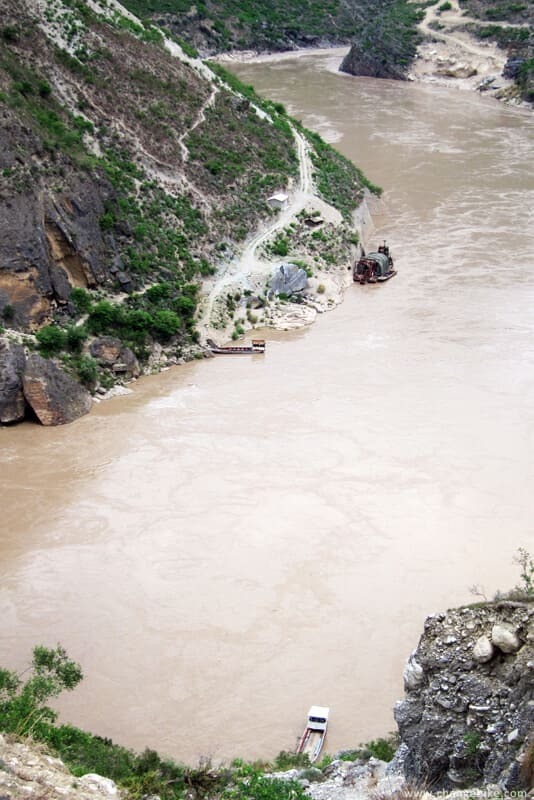 and foreigners usually like to admire the magnificent scenery of the Tiger Leaping Gorge by walking on trestle roads built along cliffs. 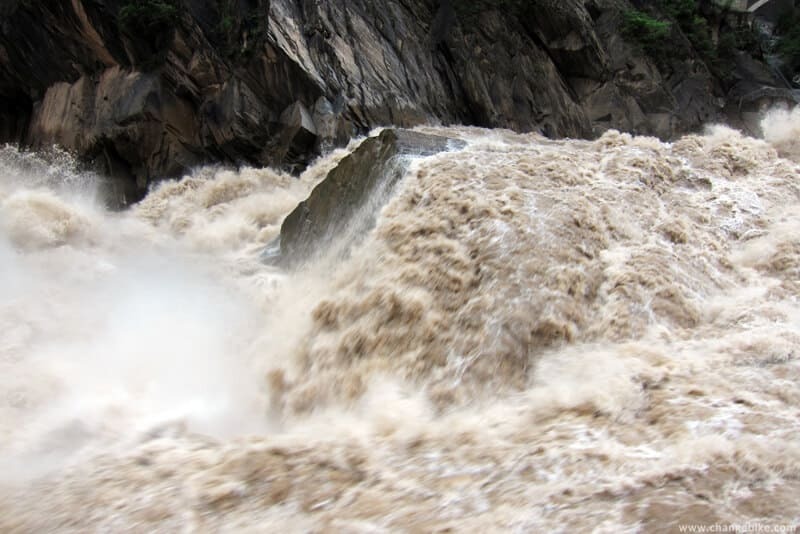 and felt that gushing big waves were rolling and foaming in my sight. 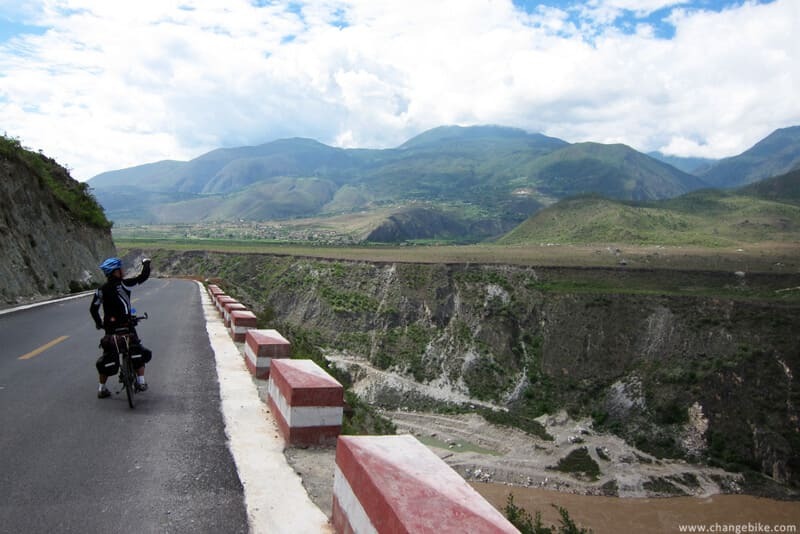 and this was the first time to see such a magnificent view in my life. 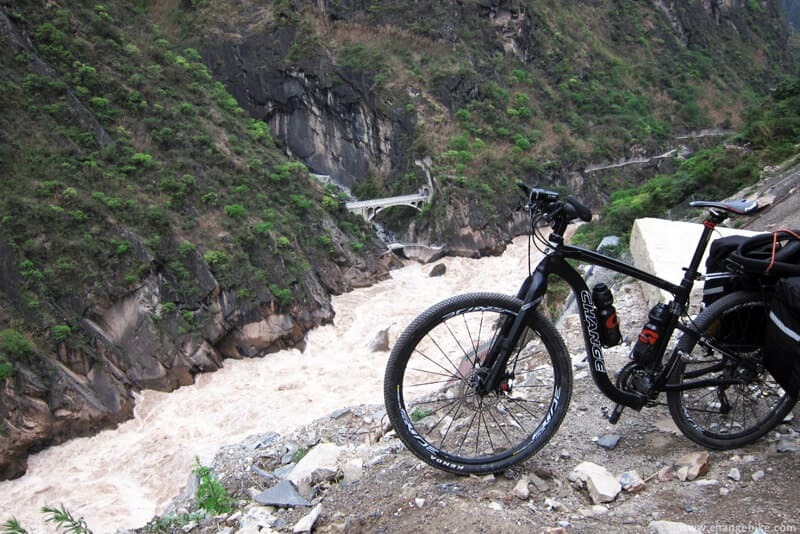 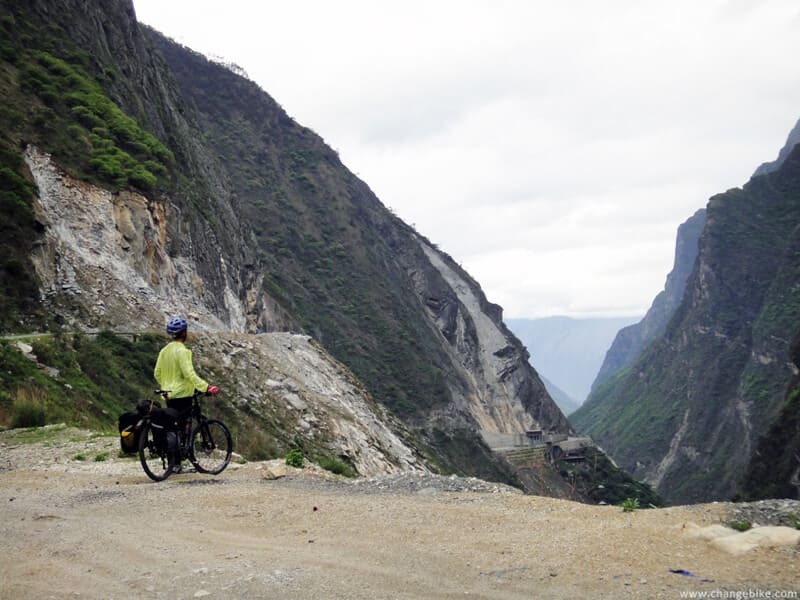 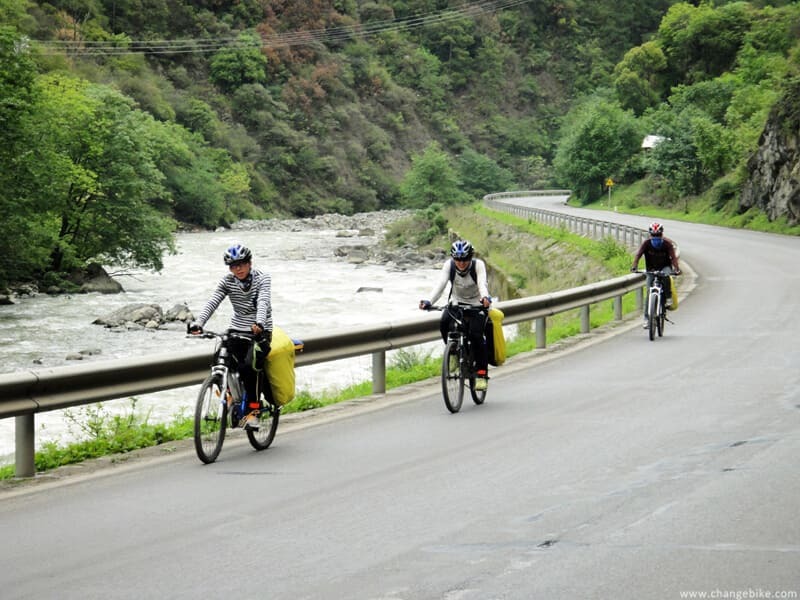 It was getting dark, so we were riding so quickly towards Middle Tiger Leaping Gorge. 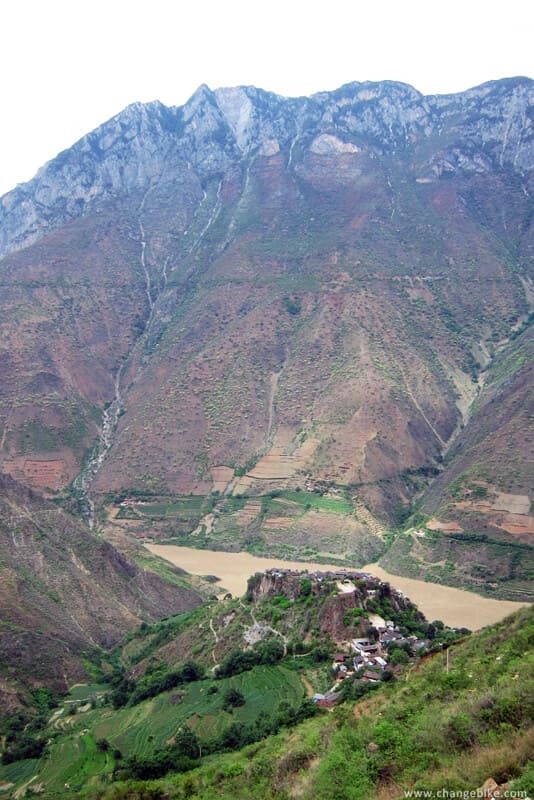 Mr. Hua had ridden to the other side of the mountain (he is the black dot). 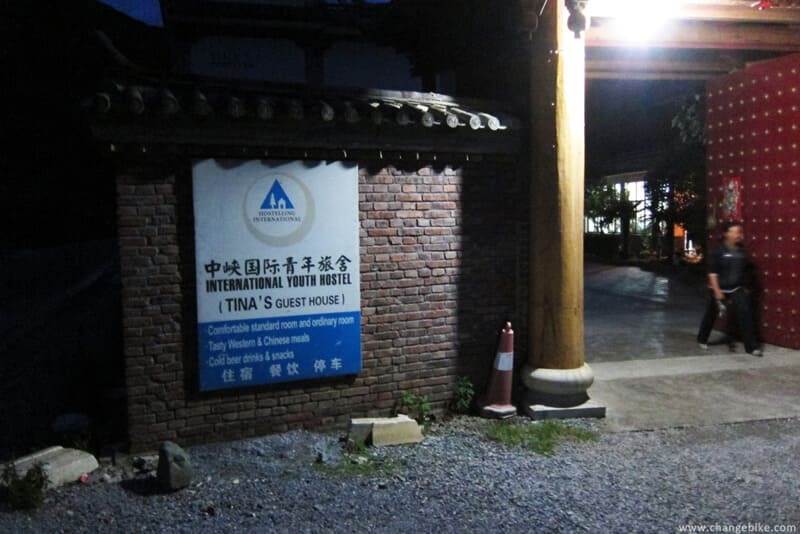 We arrived at TINA’S Guest House at 9:10 pm, and it had been dark. 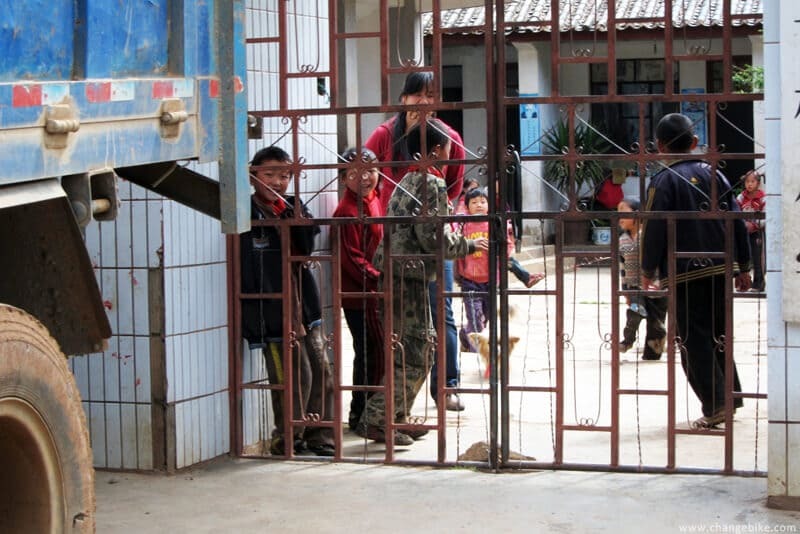 and I was honored to stay here today to be infected by their warm blood and unconstraint. 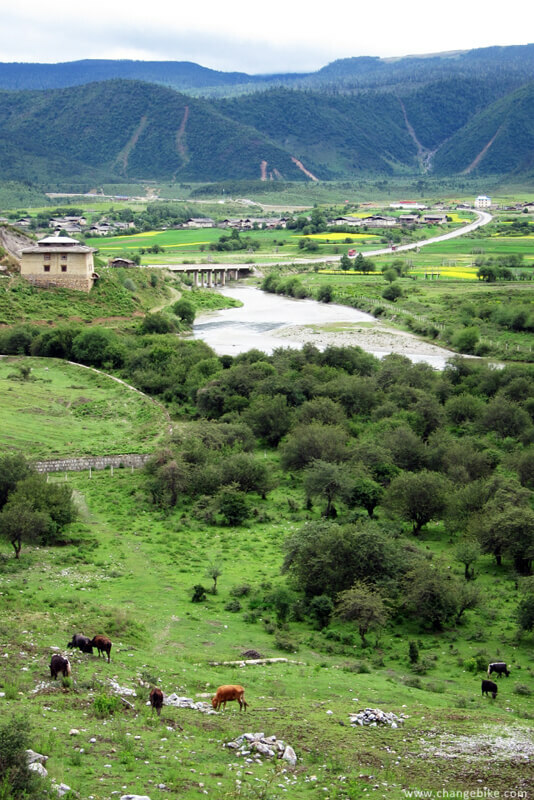 and the weather was cool and comfortable. 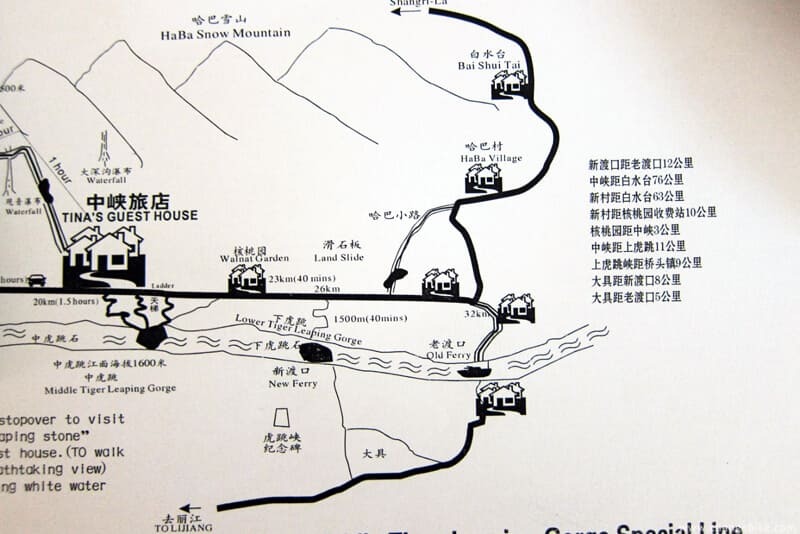 At 9:20am, we departed for today’s itinerary. 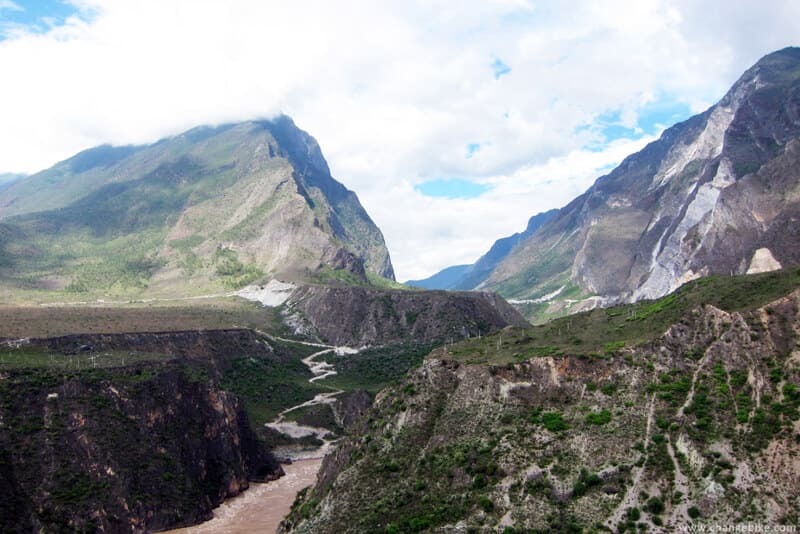 we kept admiring deep canyons surrounded by Jade Dragon Snow Mountain and Haba Snow Mountain. 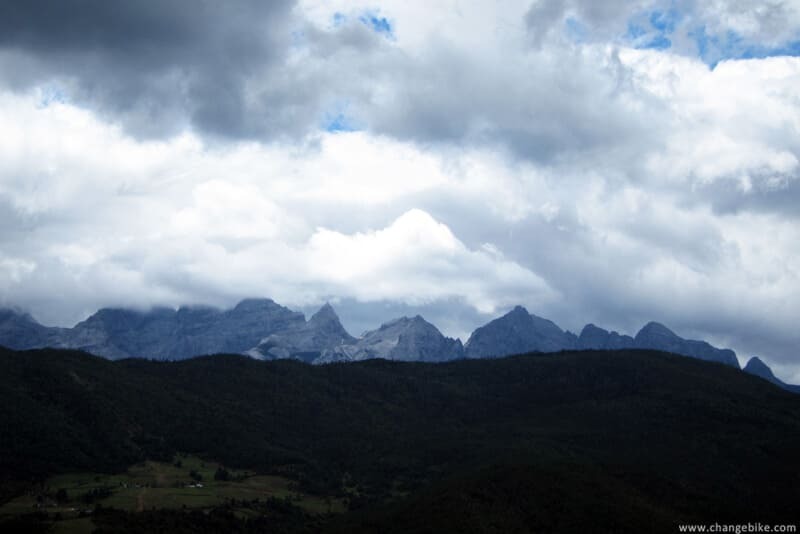 and at this time, a whole of plain unfolded before my eyes. 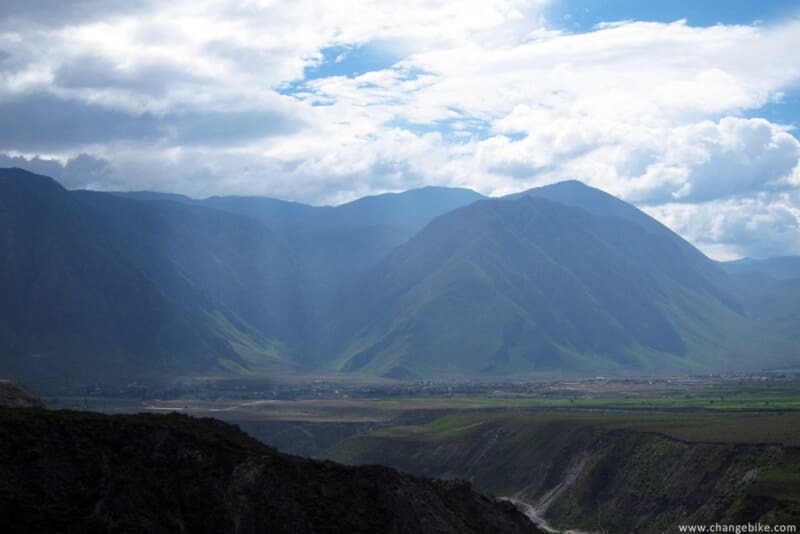 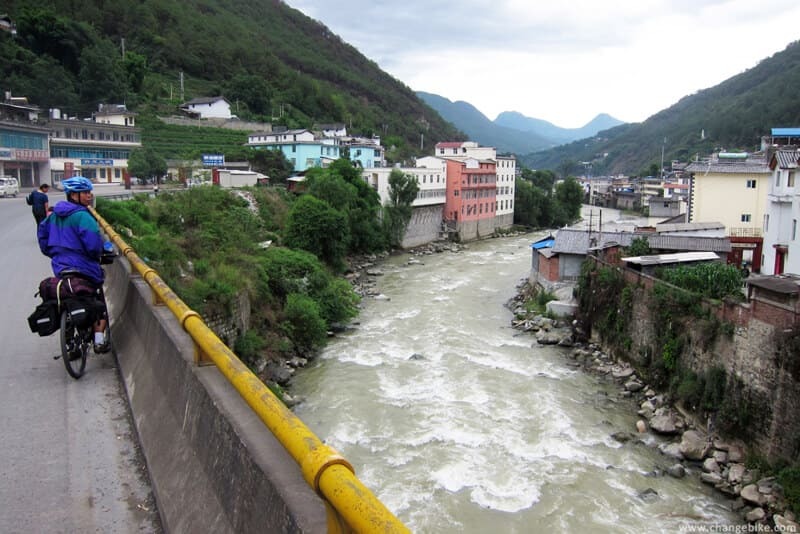 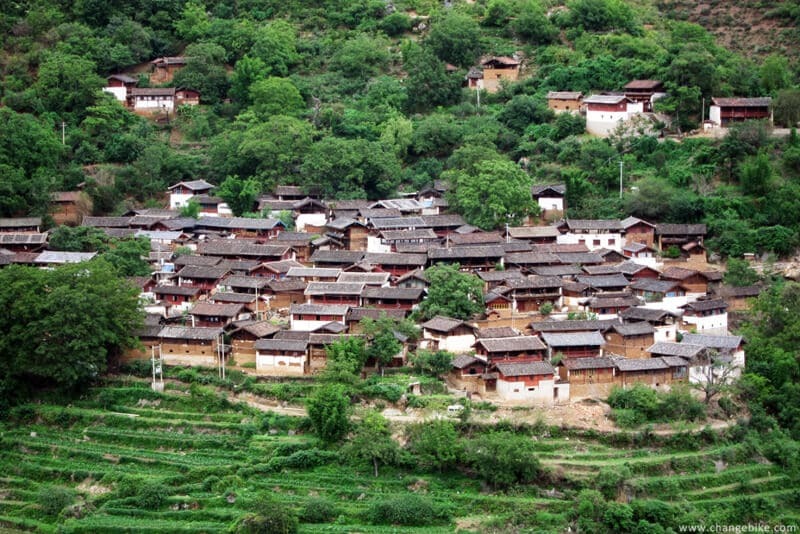 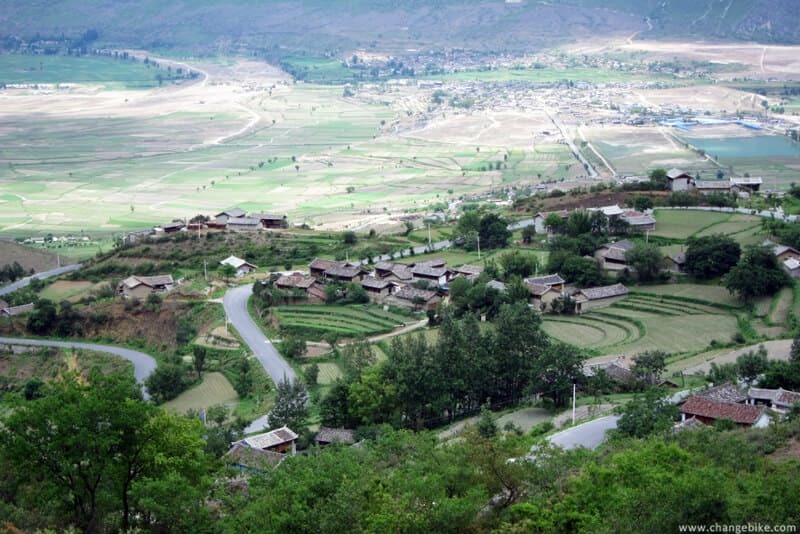 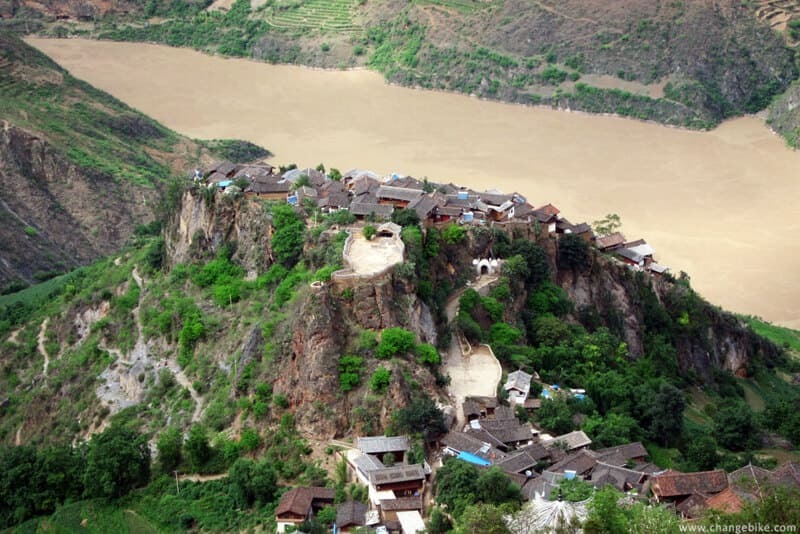 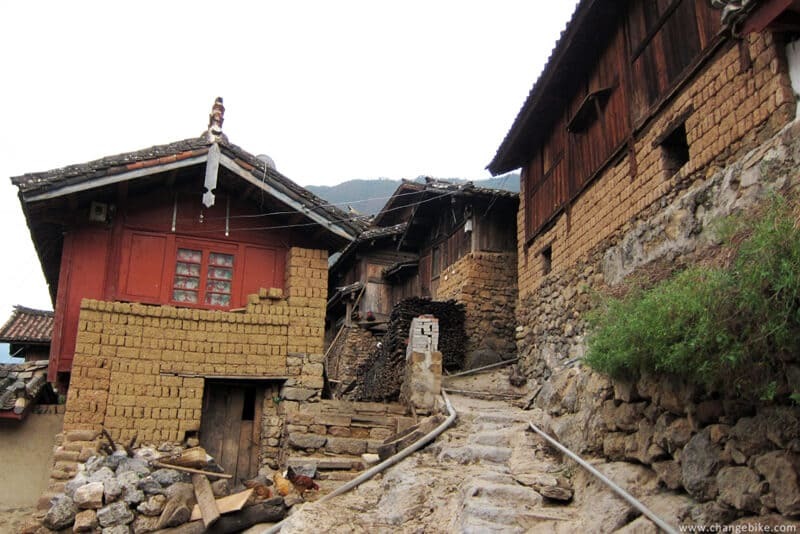 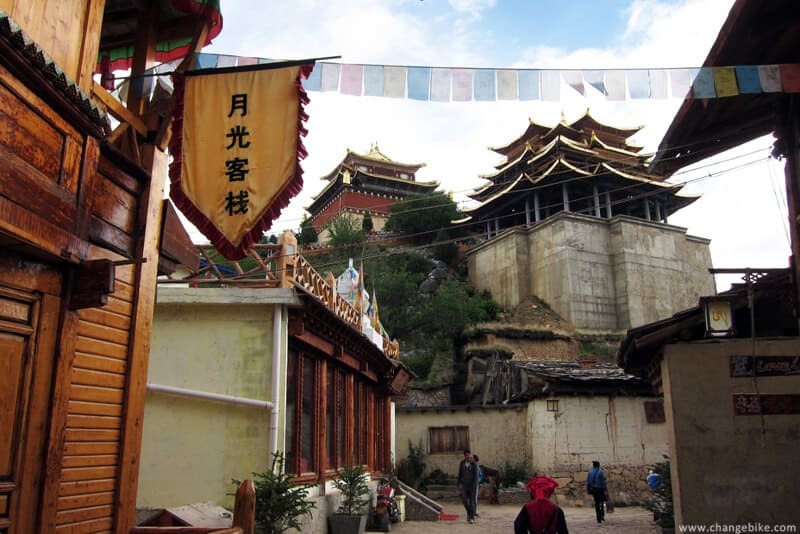 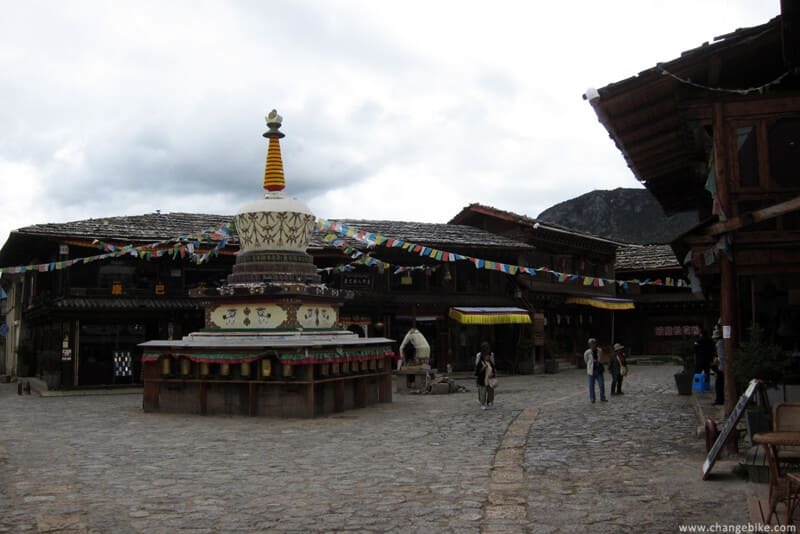 Naxi style village of Daju was located on the side of Jinsha River. 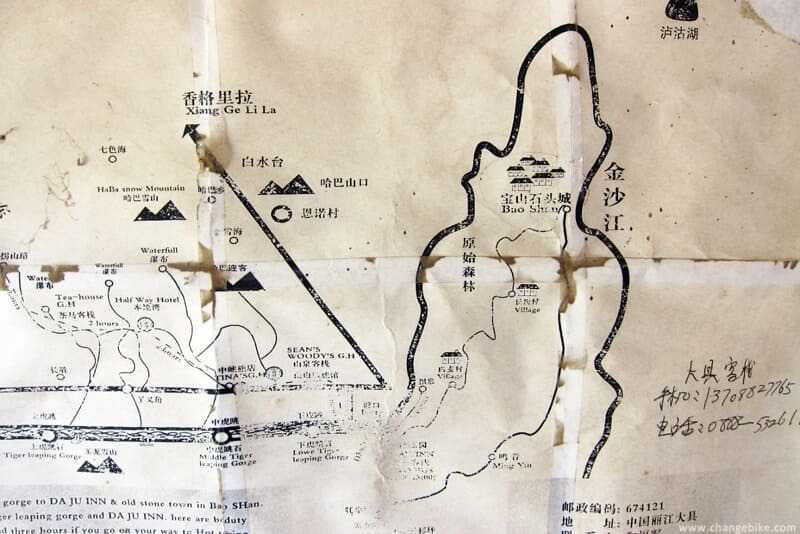 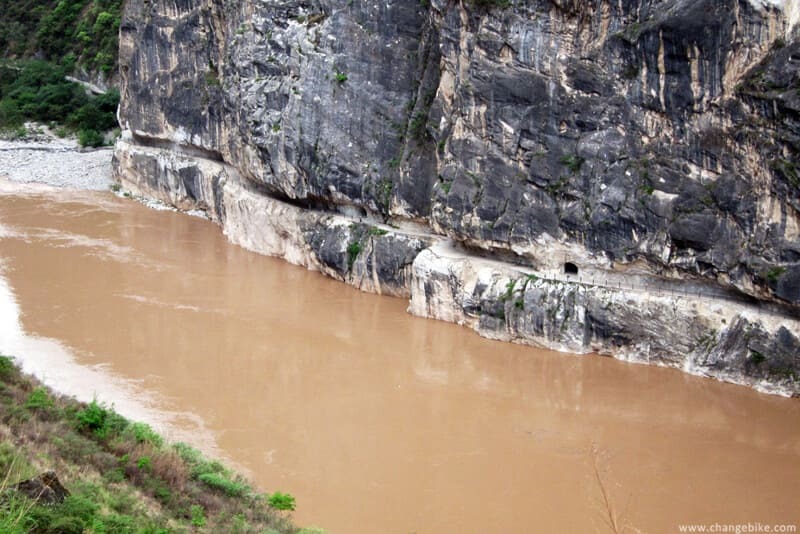 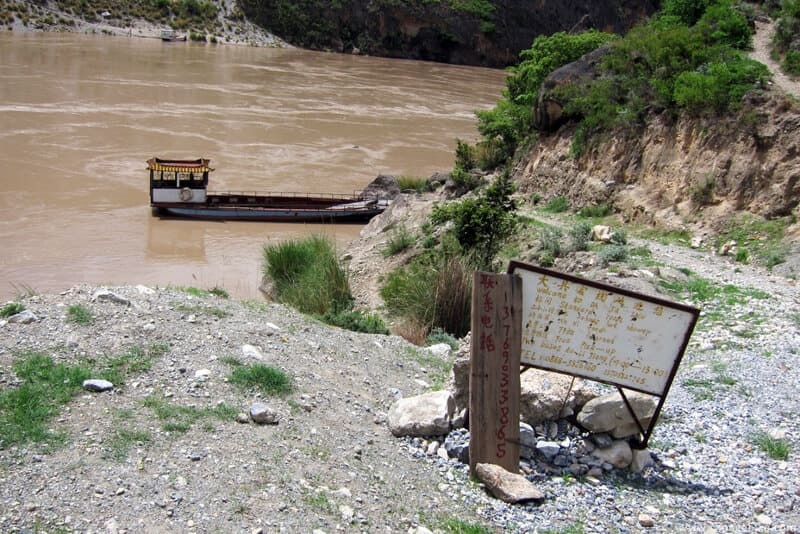 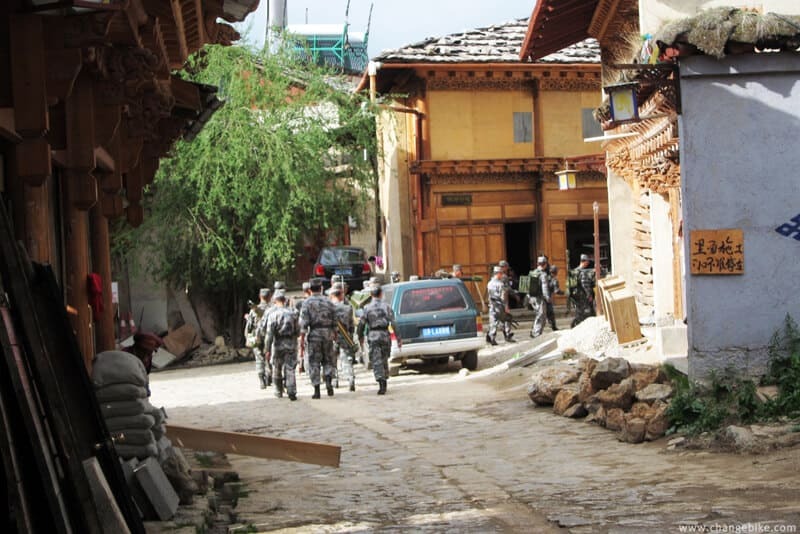 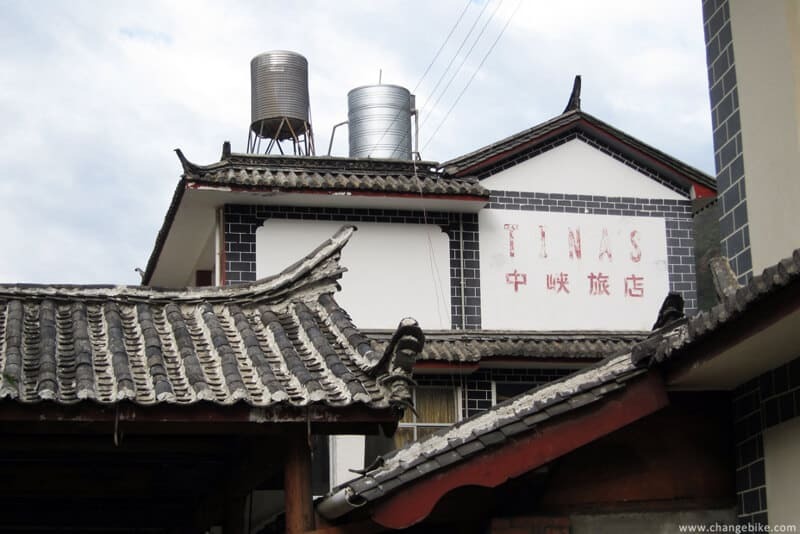 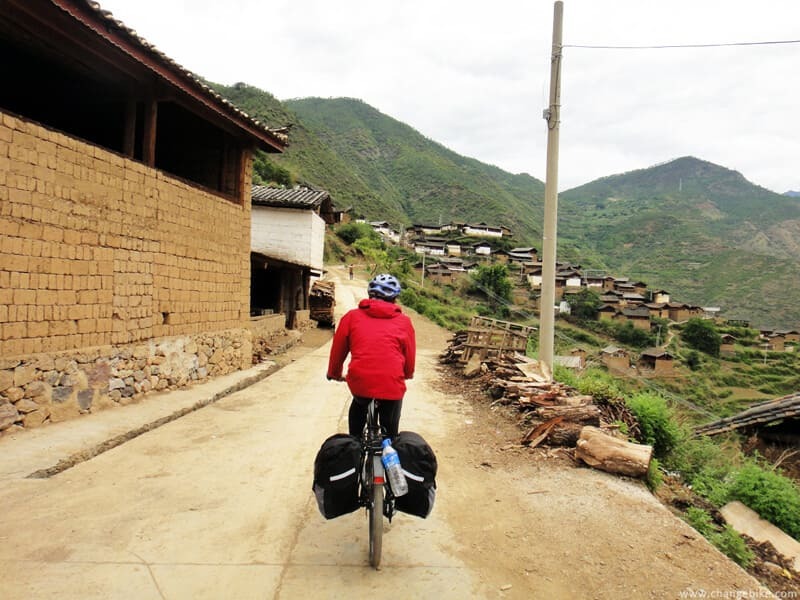 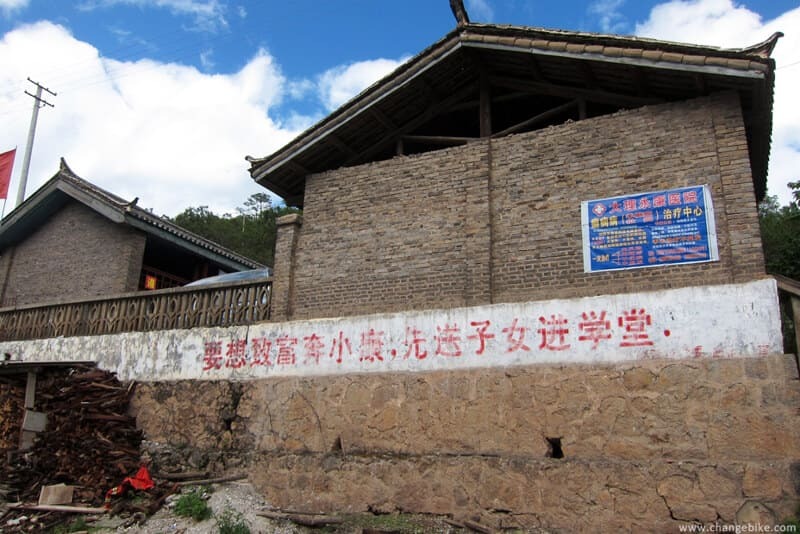 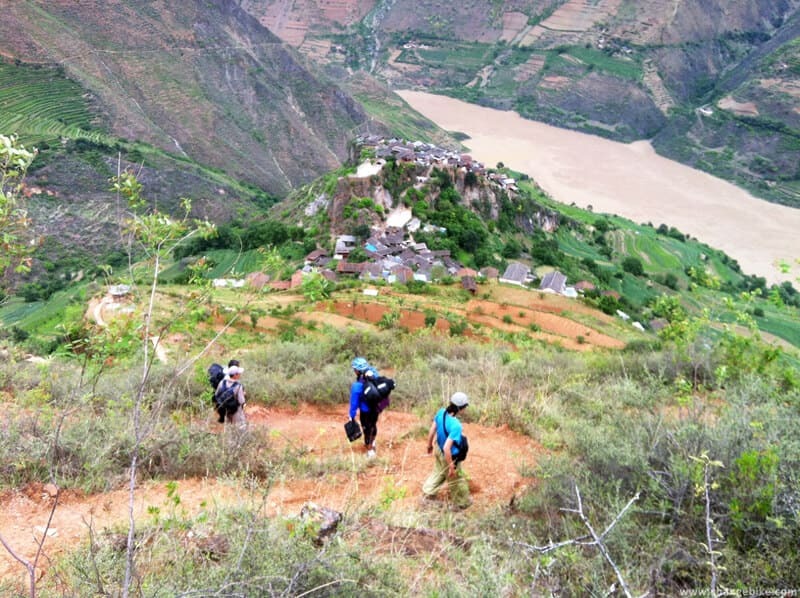 At 10:30 am, we arrived in Jianbian Village, and started to search for an old river crossing. 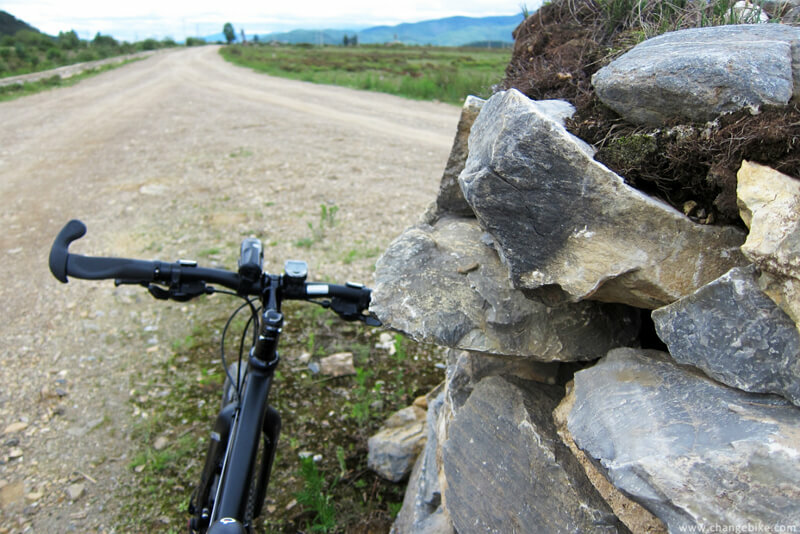 Unexpectedly, we had to ride for (or walk our bikes) a section of downhill road with gravels. 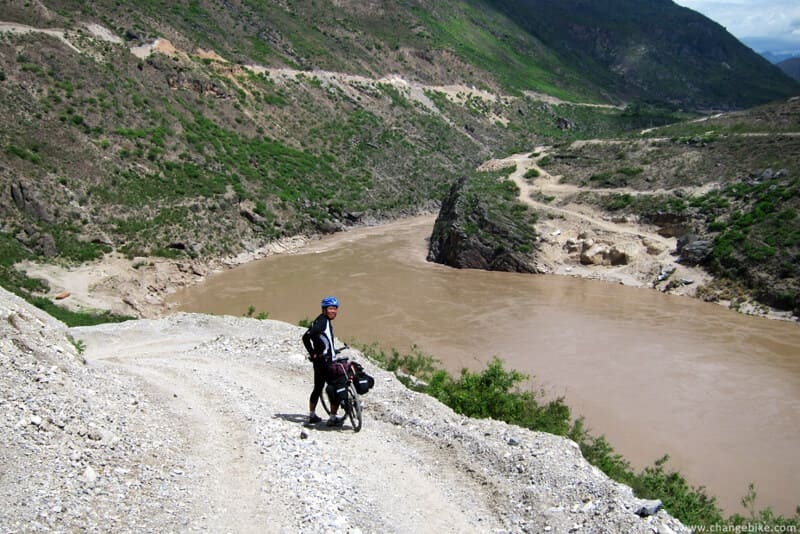 Here was the riverside where we had ridden downhill about 150 meters. 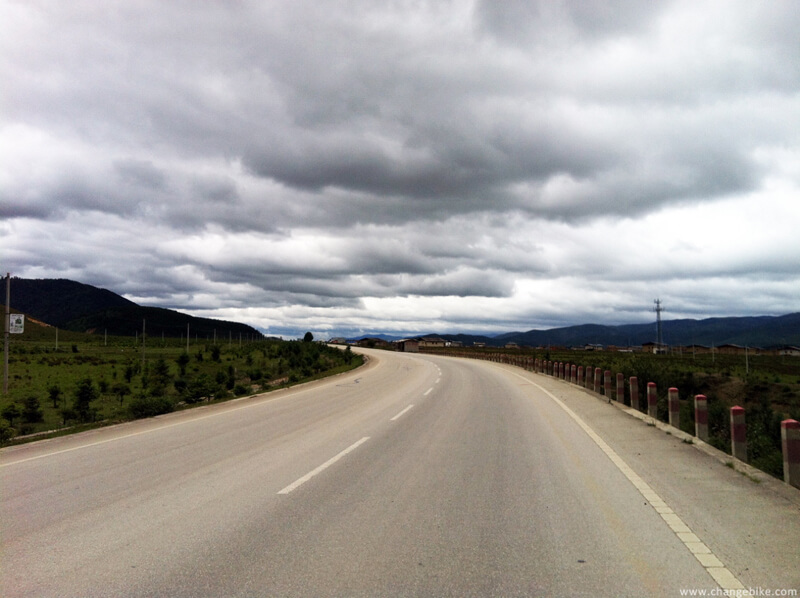 however, I spent one hour searching the road. 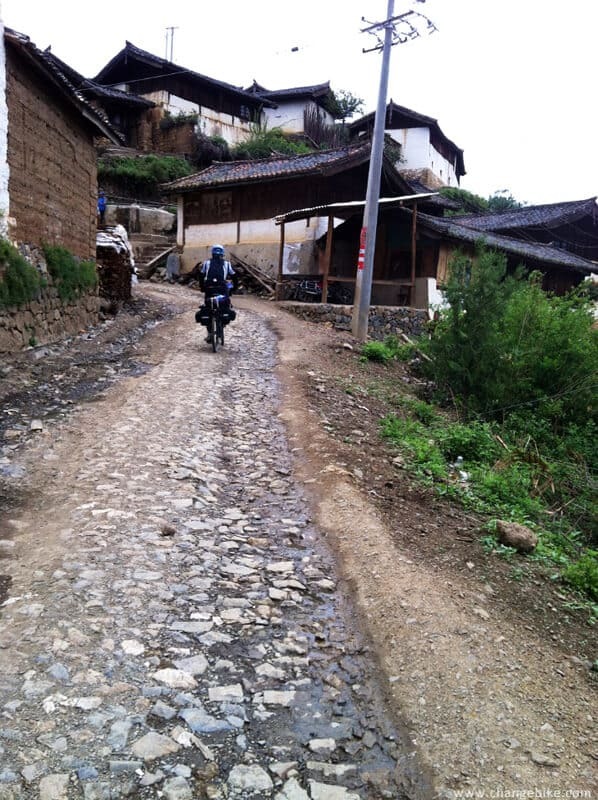 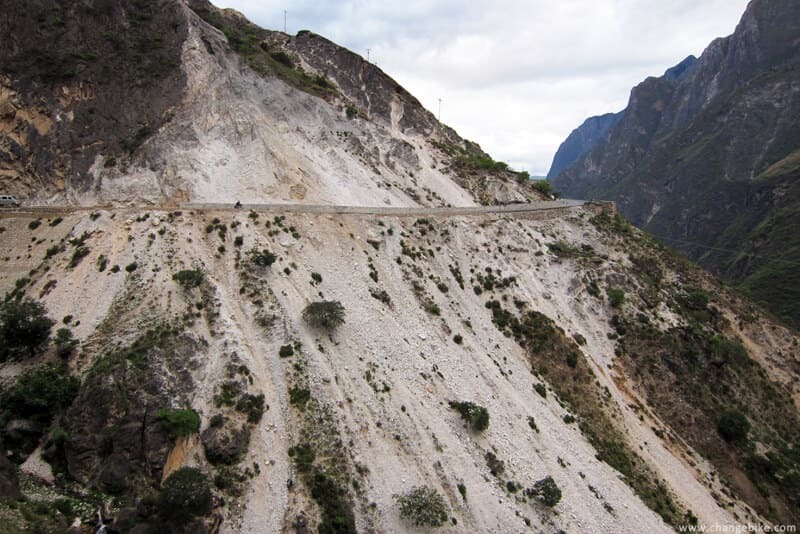 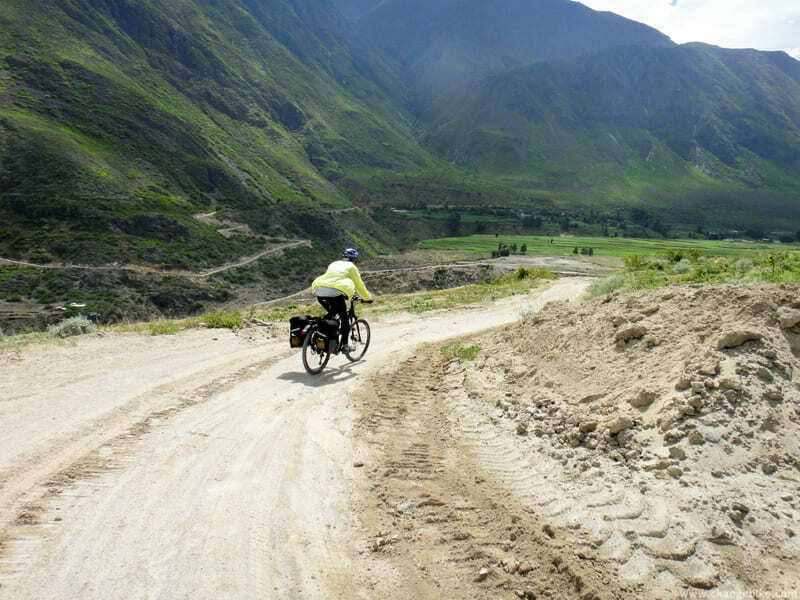 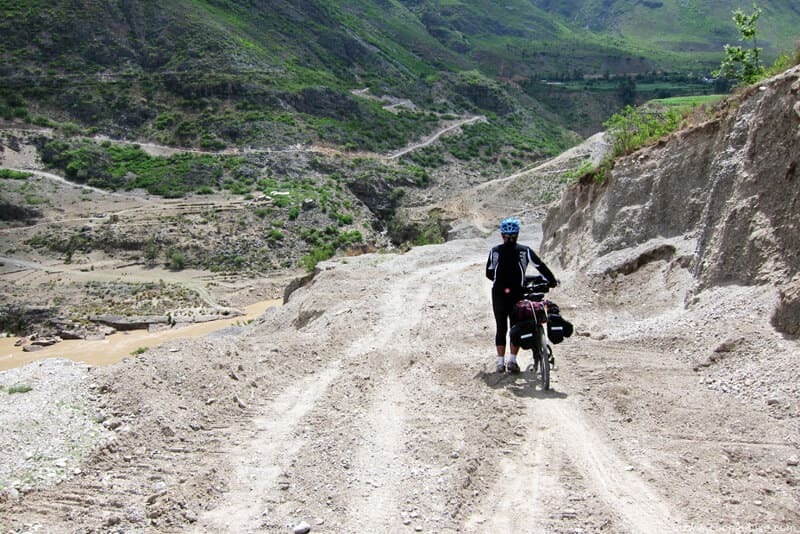 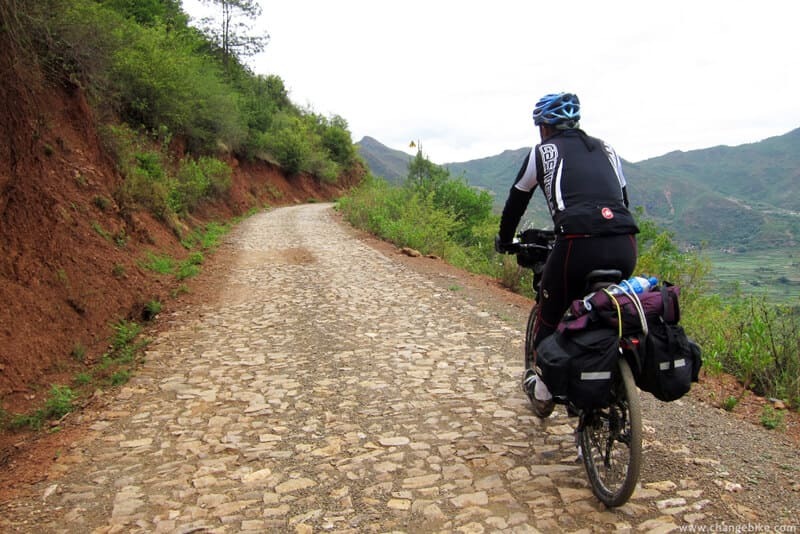 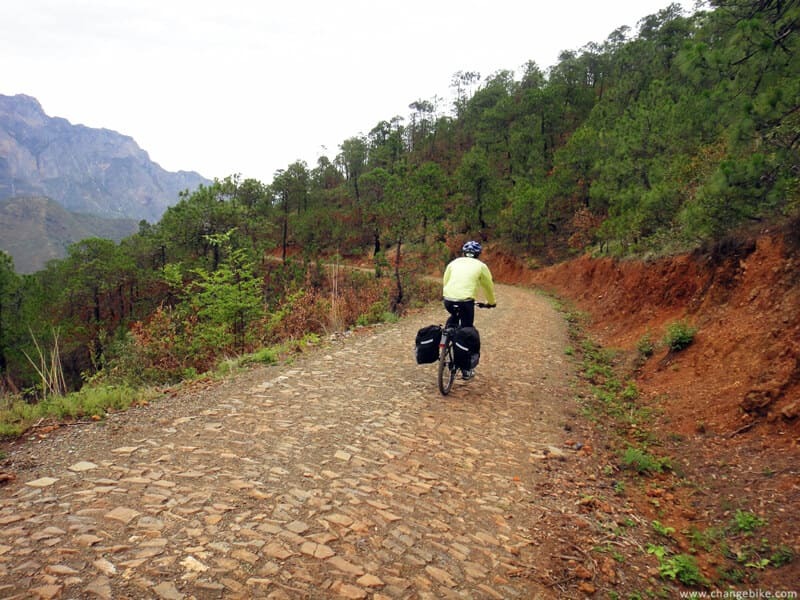 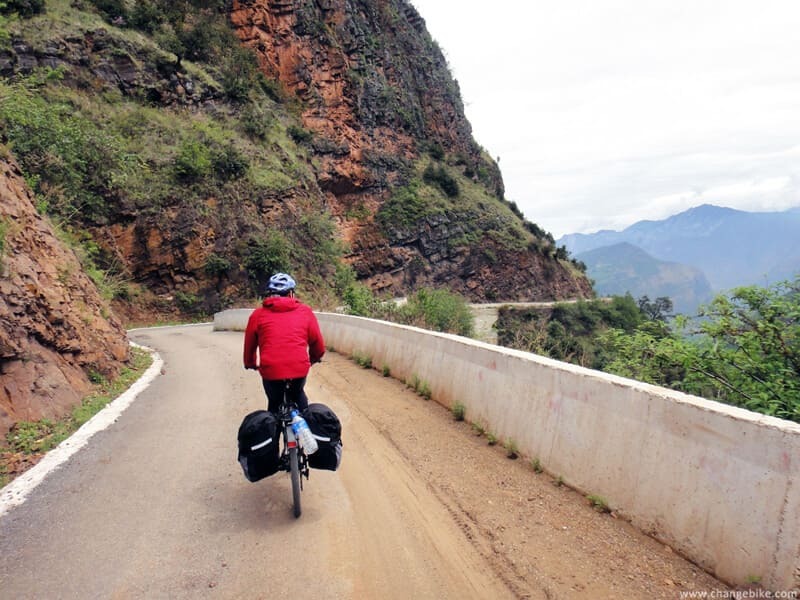 The most terrifying thing was that we would have to walk our bikes uphill for 150 meters along lightning-shaped gravel. 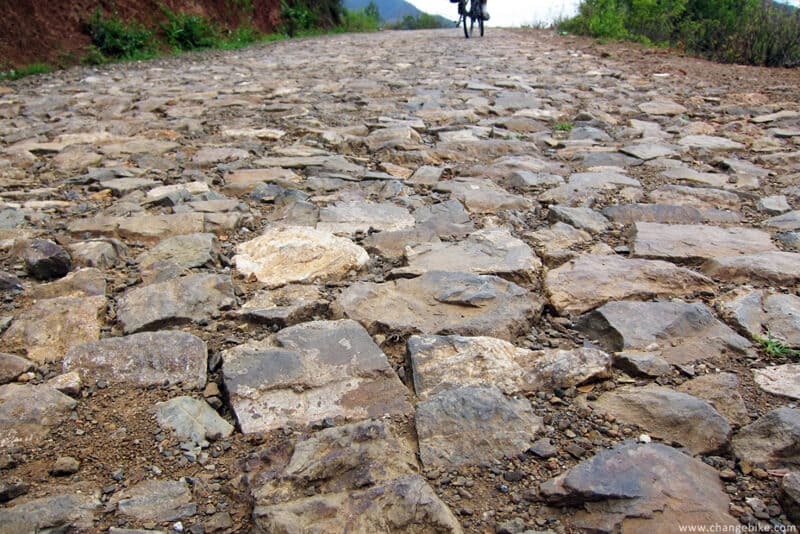 however, it took me two hours and half! 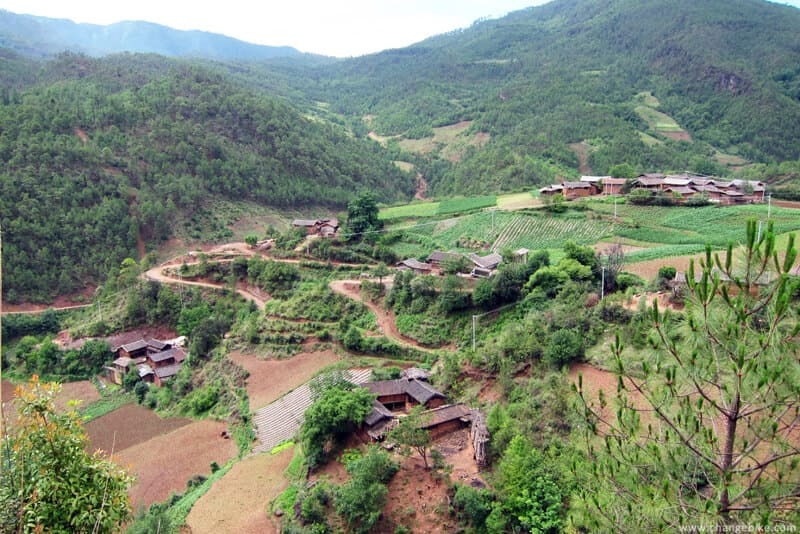 After having lunch in Daju, we hired a driver to drive us to Maoniuping. 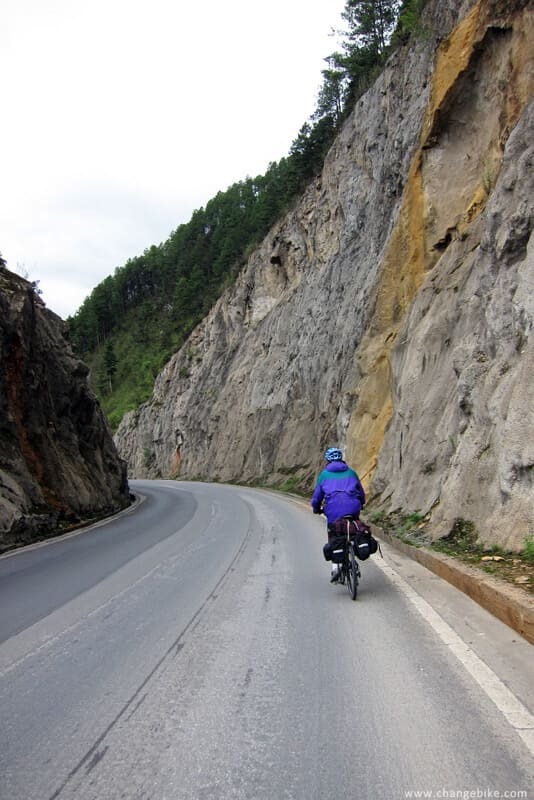 Instead of riding uphill for 1700 meters, today’s itinerary would be the shortest in recently days. 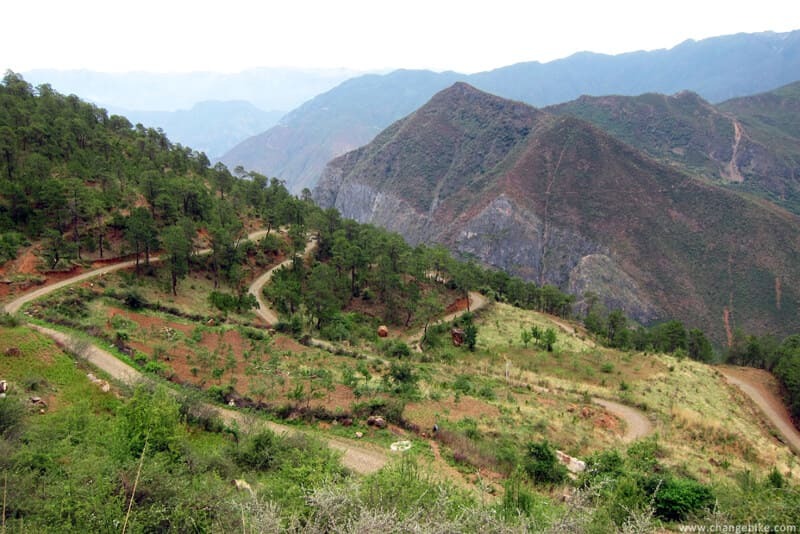 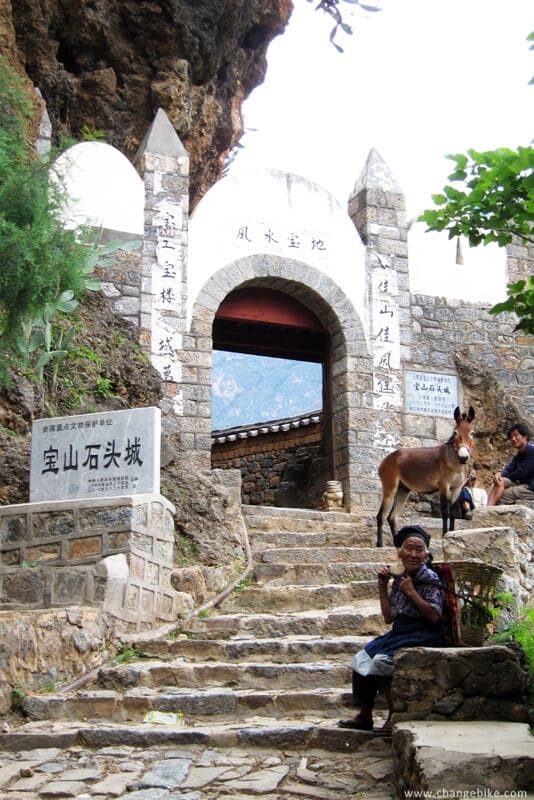 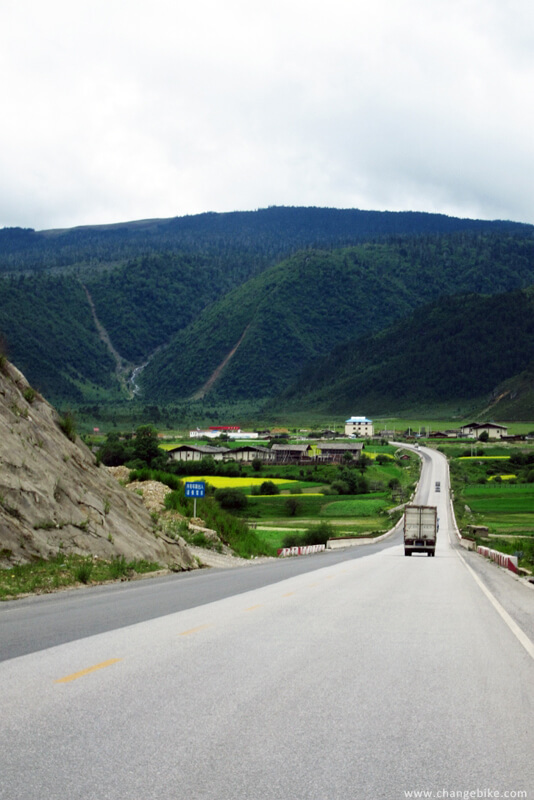 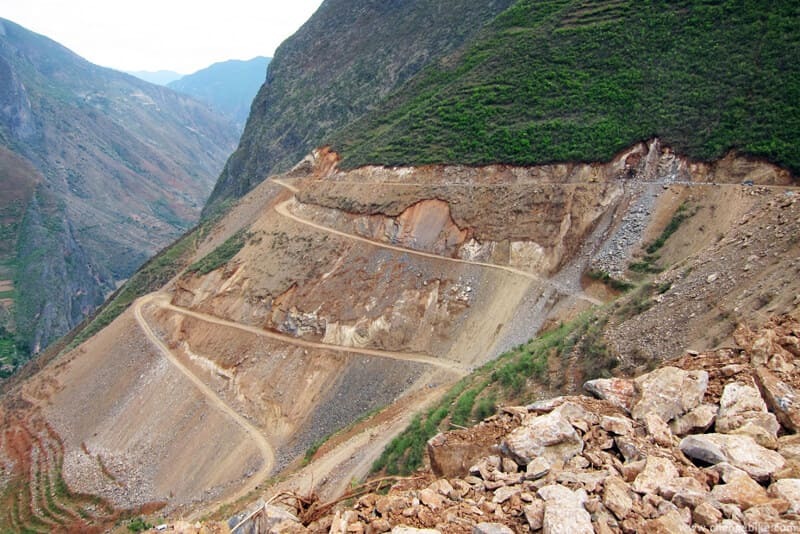 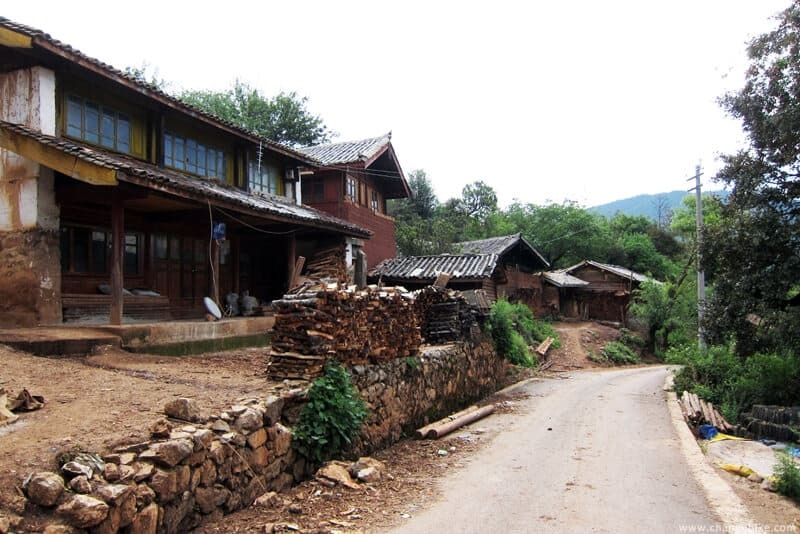 which is a hamlet away from Baoshan Stone Village for 50 km. 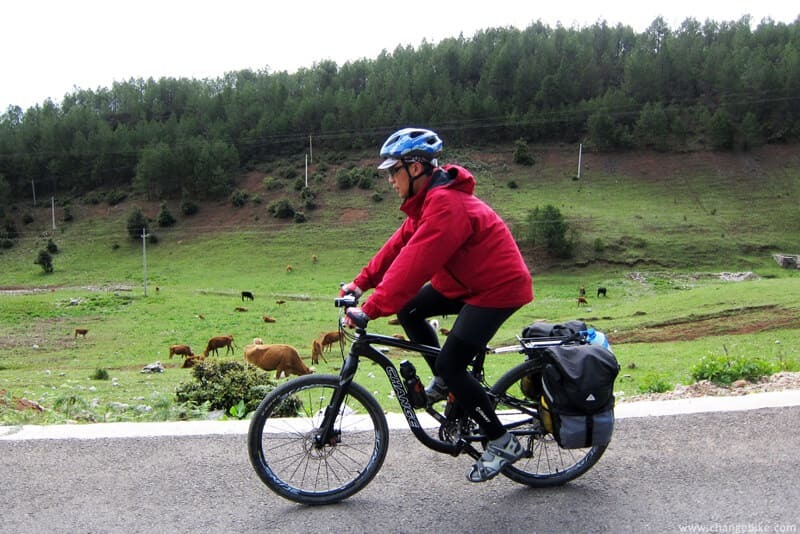 and even deliberately rode slowly in coniferous forests to admire Naxi style idyllic scenery where the people farm for livings. 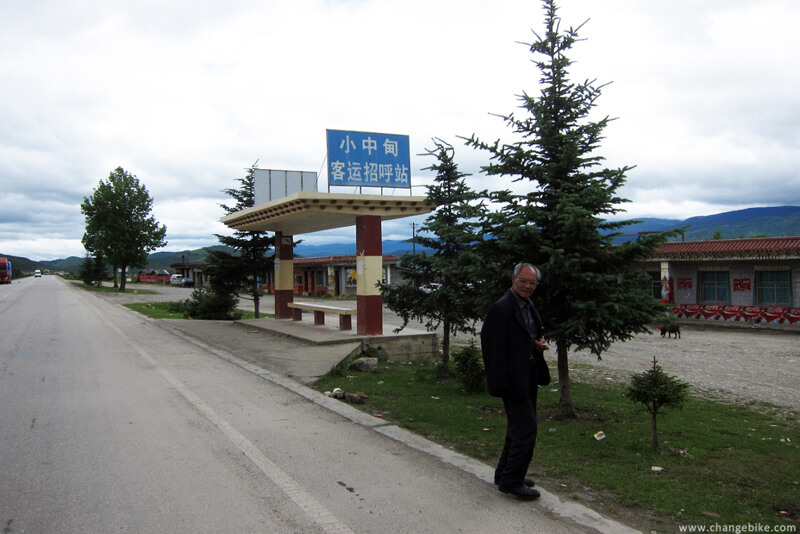 At 5:38pm, we arrived in Ming Yin. 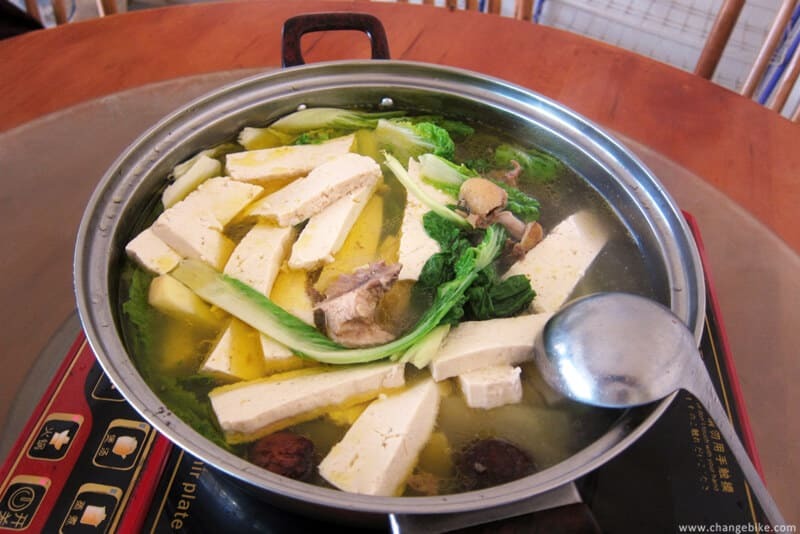 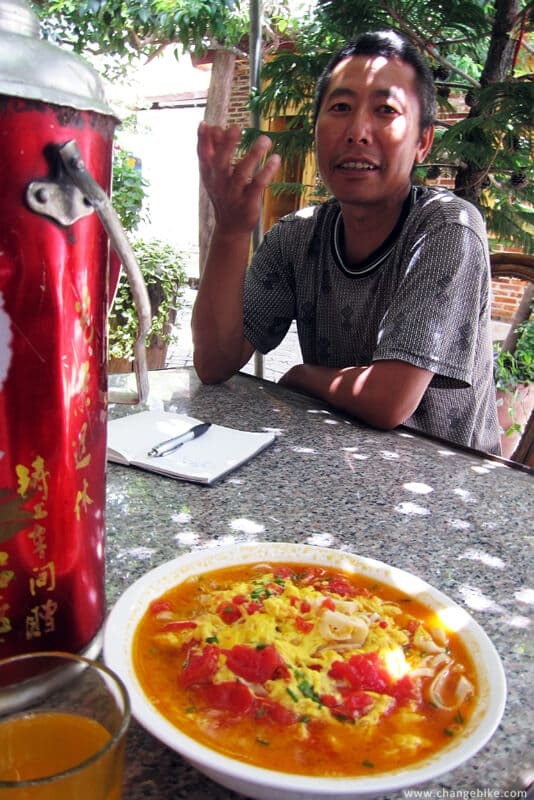 We asked the landlord to prepare a local chicken hot pot (RMB60) for our dinner. 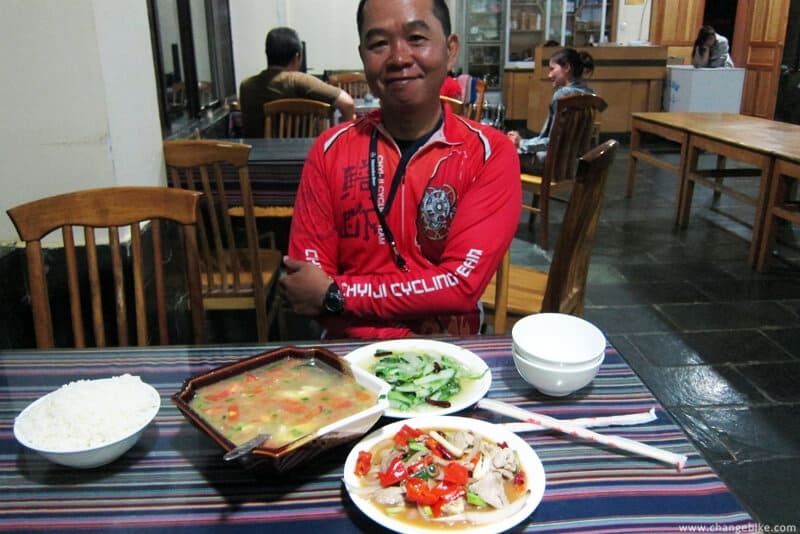 However, maybe something wrong with water quality, Mr. Hua and I got diarrheas after dinner. 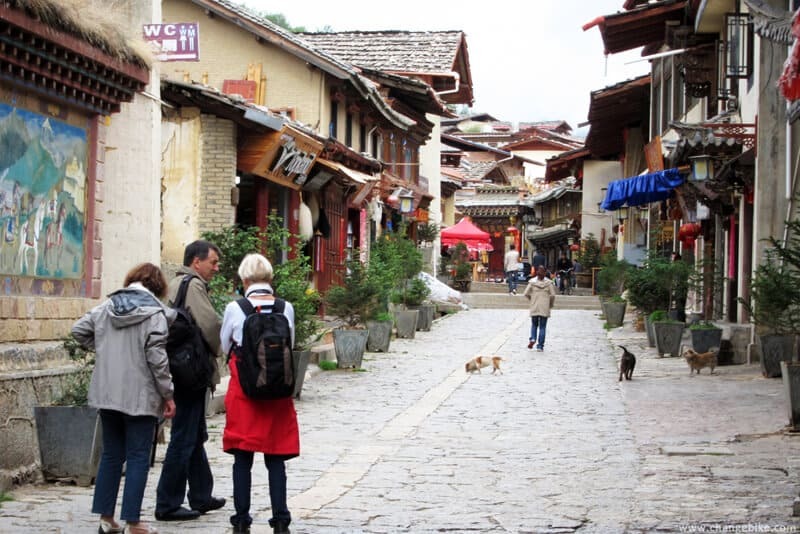 At 9:15 am, we started from Mingyin, and the destination would be Baoshan Stone Town. 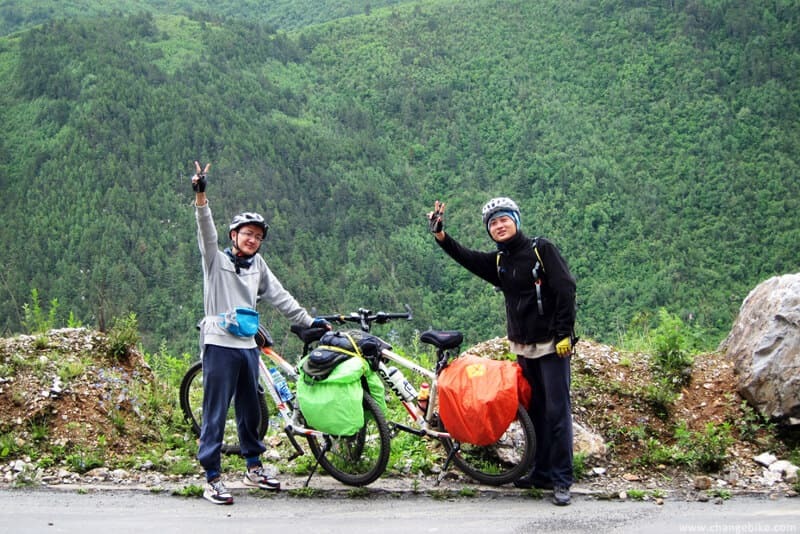 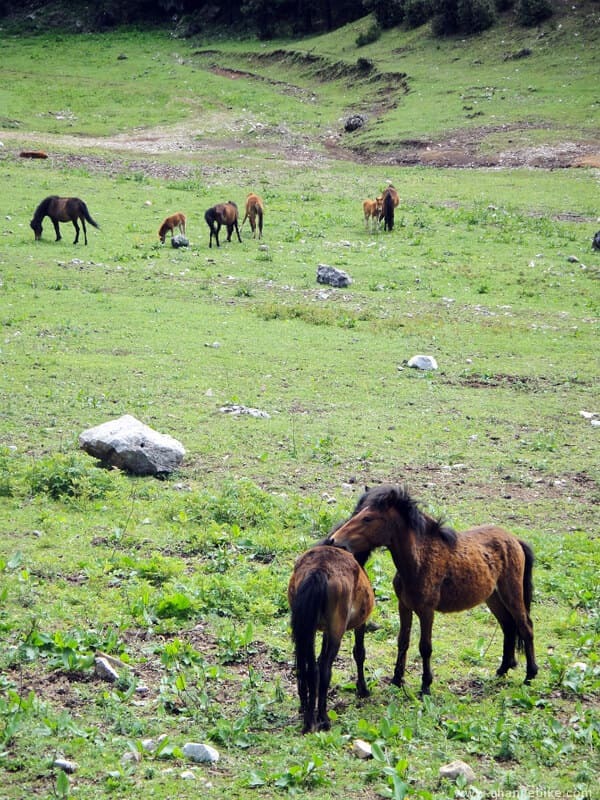 The weather was cool and mild, and we had to ride uphill for 350 meters to a high point of an altitude of 3200 meters. 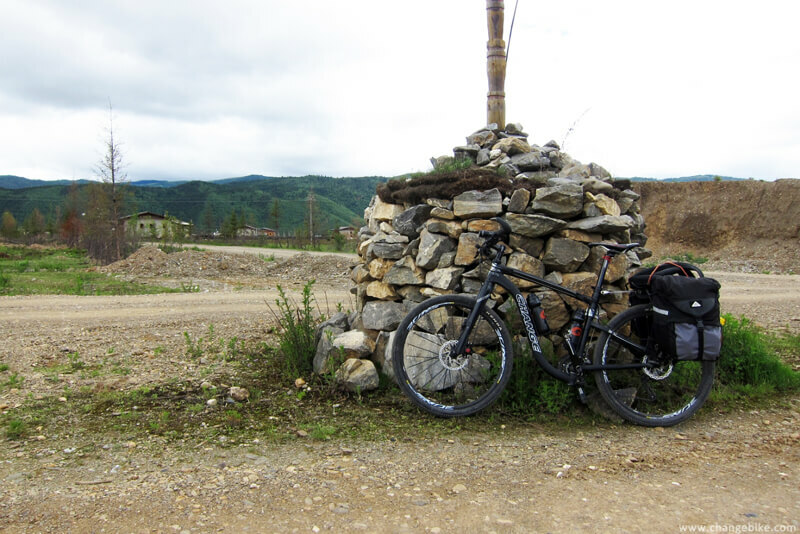 and then arrived in Baoshan (the mileage was 25km, and the altitude was 2200m). 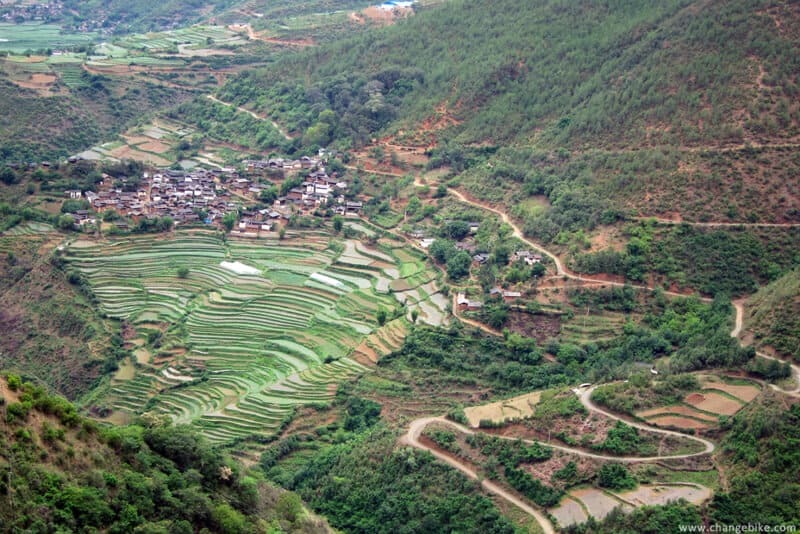 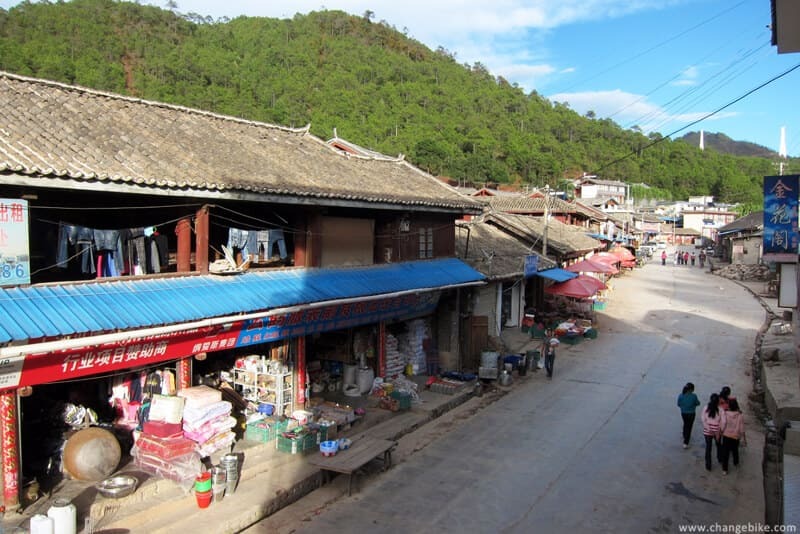 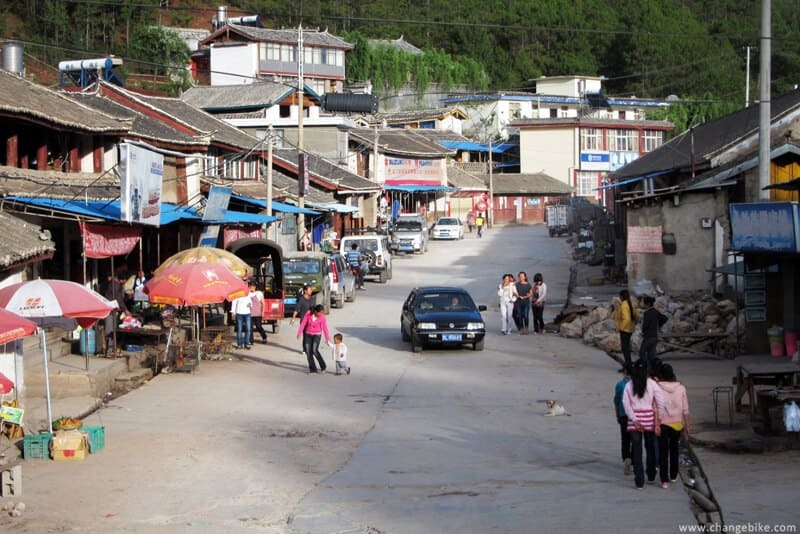 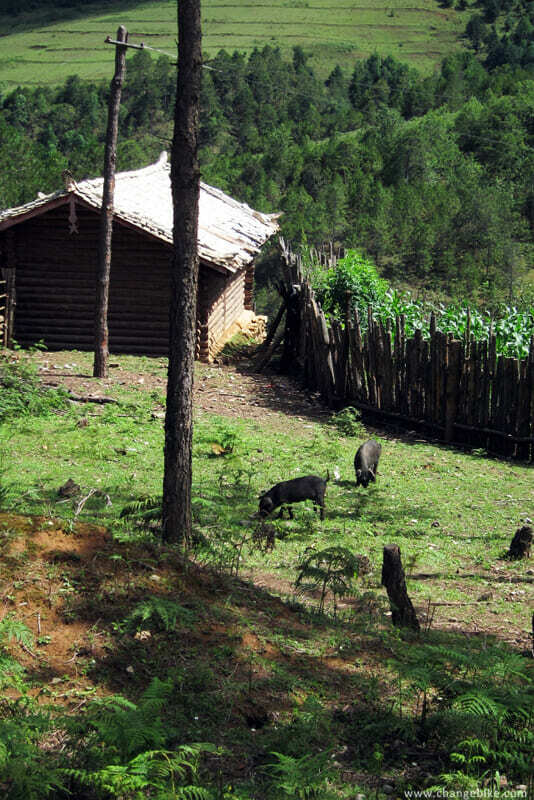 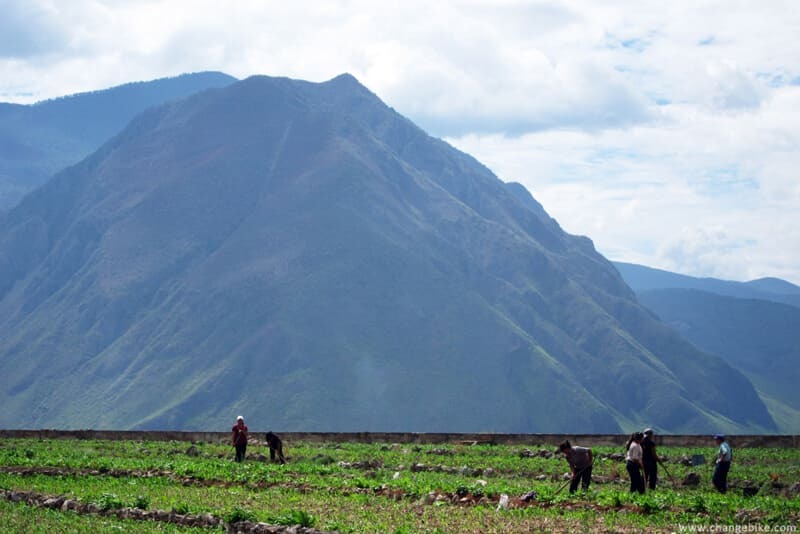 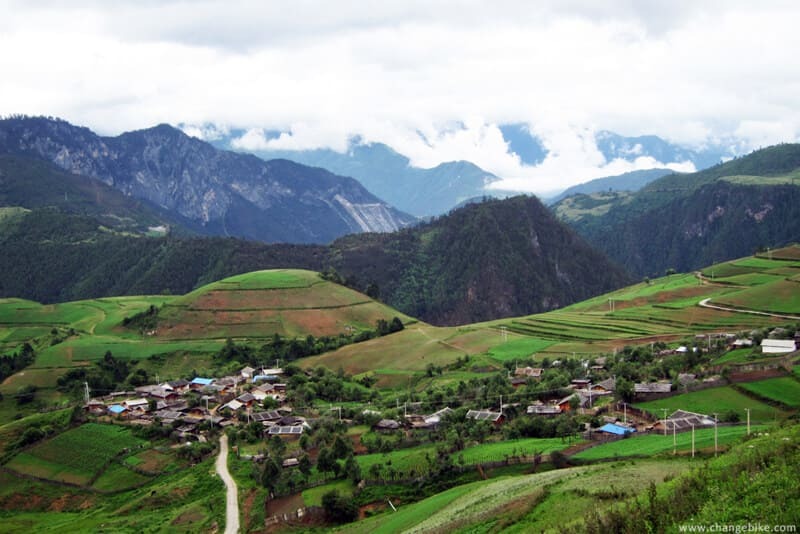 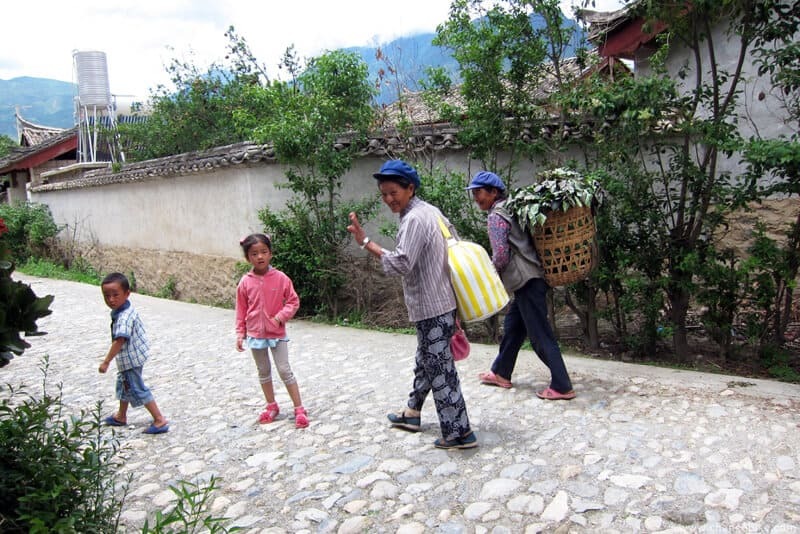 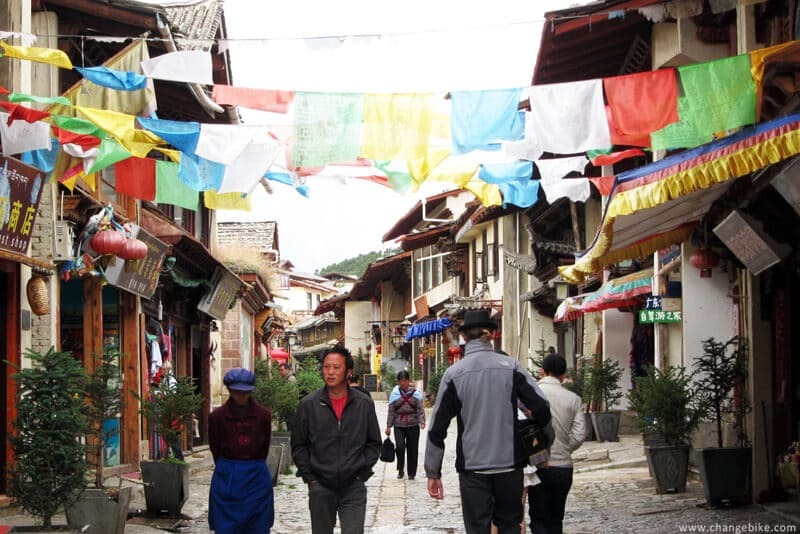 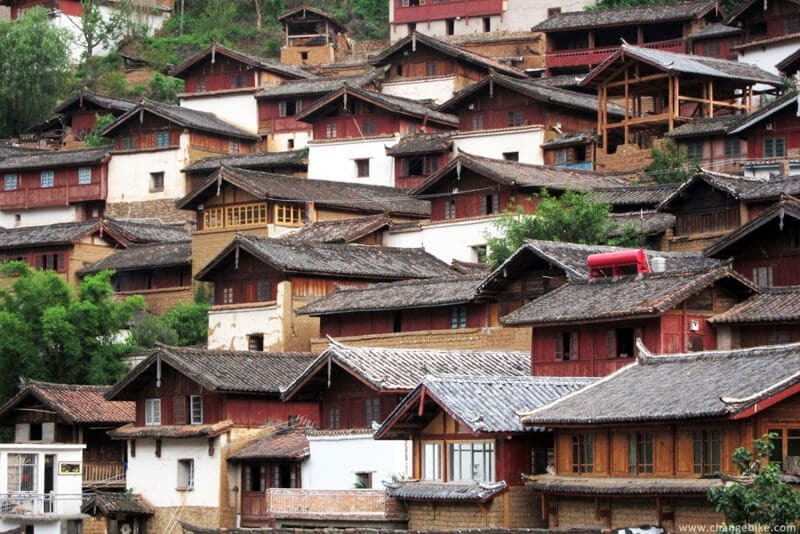 We heard pleasant bird songs and saw the Naxi style village and terraces along the way. 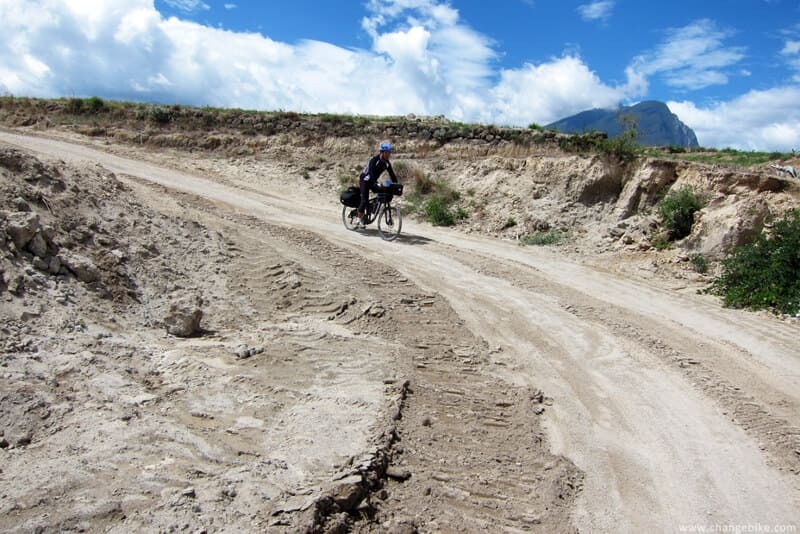 It was an uncommon experience for us to ride on such a bumpy road. 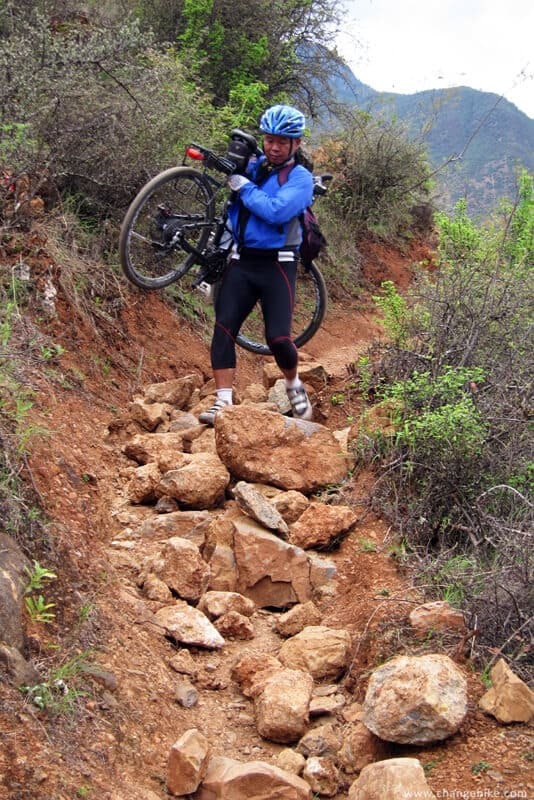 We felt pain on our elbows while braking downhill causing shake. 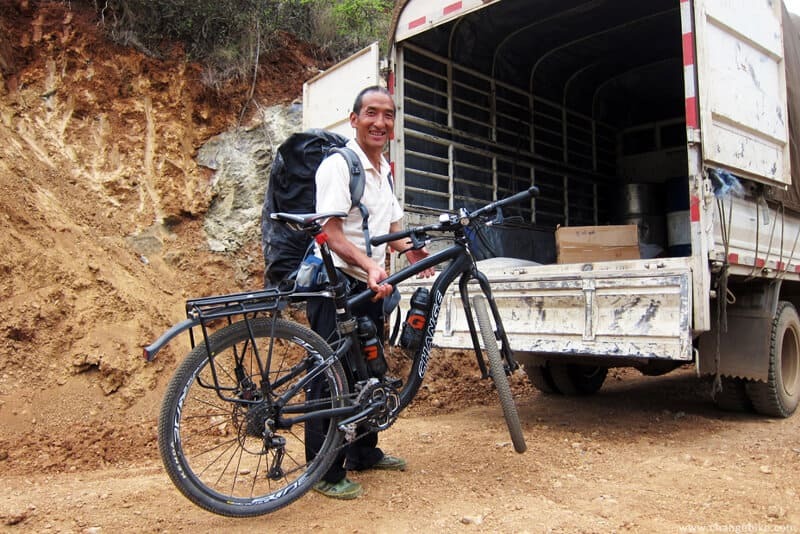 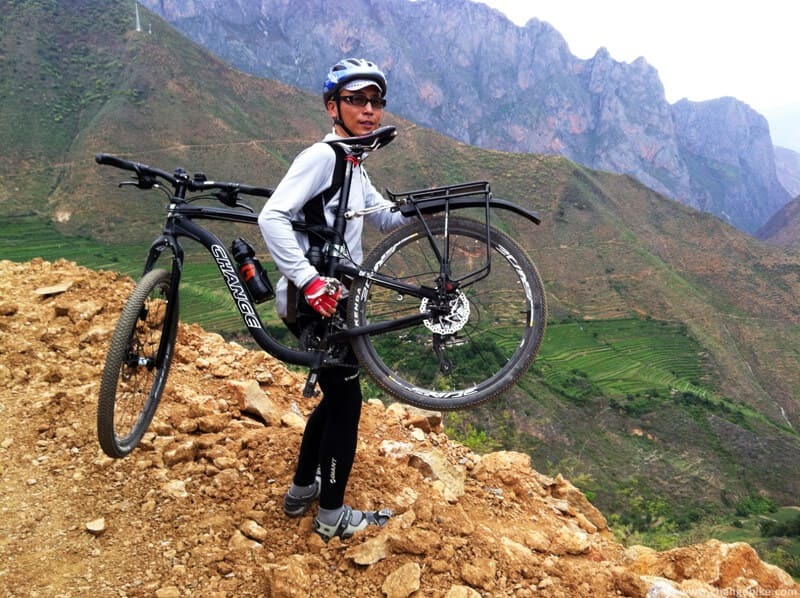 Mr. Mu, the shopkeeper in Baoshan Stone City, said the bike is very light! 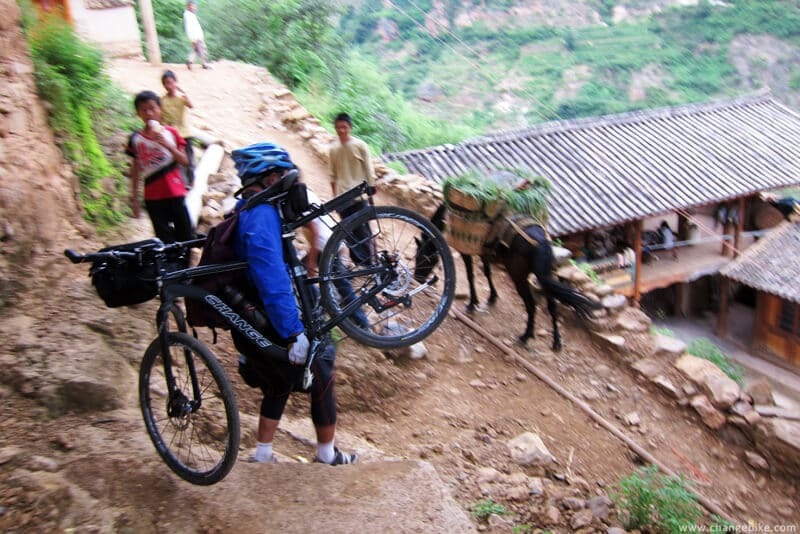 The road collapsed, so we had to carry bikes downhill for 150m. 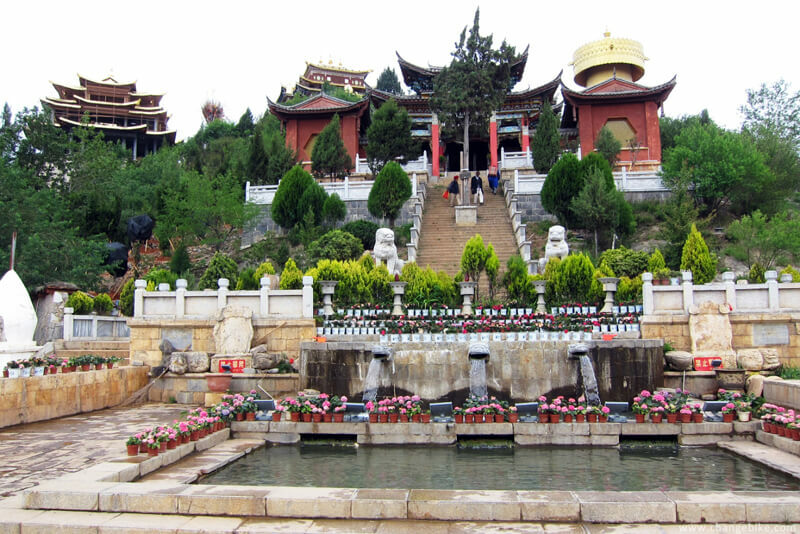 The scenery in Baoshan Stone City. 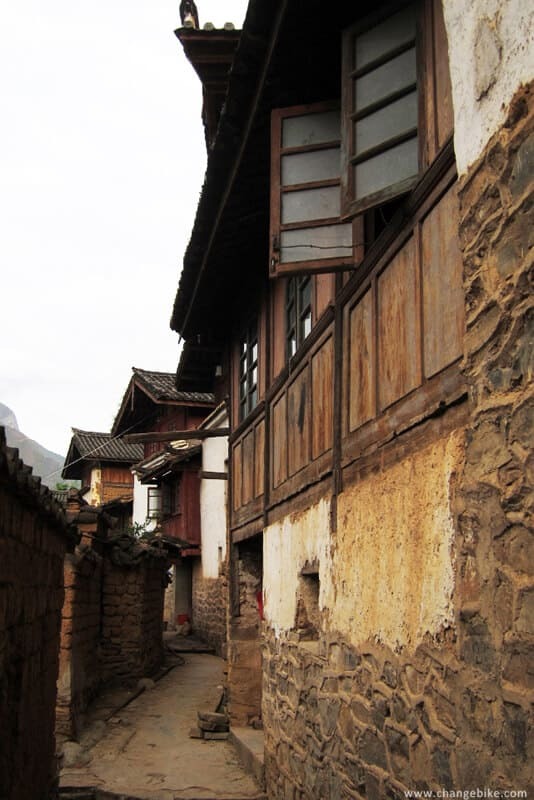 We enjoyed the wind in the evening, and looked at Naxi style residences outside the town. 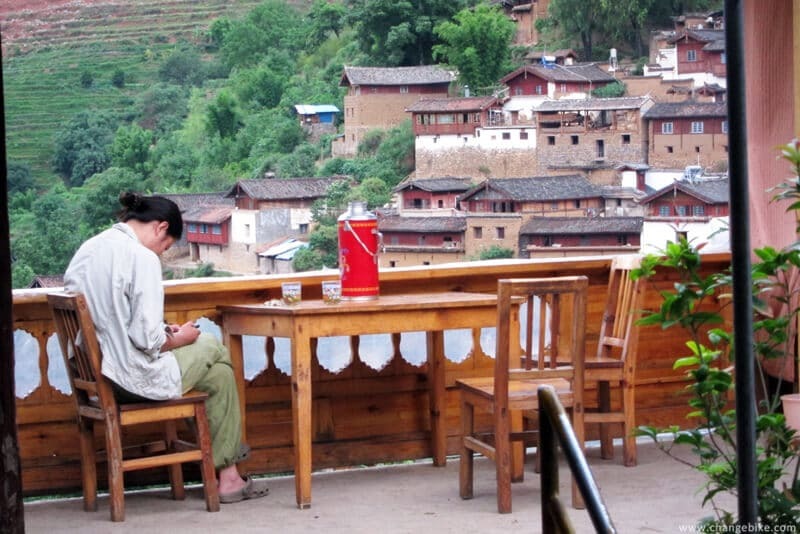 Additionally, we tasted tea, talked about the travel, and this was the leisurely time.